Two researchers with lived experience have travelled on secondment from UK to Spain to peer evaluate response to the Good Life Kit. Julie and Binta have a full schedule to develop and deliver 4 workshops to groups of people with memory and cognitive difficulties, their care-givers and trainee support workers, to test the acceptability of The Good Life Kit. Participants are delighted to share memories during THIS IS ME and nod in agreement with one another’s recollections. There is laughter at a suggestion that we should act out our memories of dancing and other past pleasures! Very noticeable, during the progress of one workshop, is the positive experience of two women, both with significantly impaired memory; and how their partners respond to a gradual blossoming within our two previously passive participants; a change that impacts joyfully on all of us. We are able to show that, with support and within a non-judgmental setting, anyone can be included in the game play. For one woman this is re-learning when and how to throw the dice. Her partner, relieved that mistakes are not judged or stigmatised, noticeably steps back and relaxes, instead of trying to protect her by limiting her involvement. Although she is not able to offer a reflection, she looks forward to her turn with the dice coming round each time and engages with other people in the group as they play. For a second woman, the impact of game play is obvious to all her co-players. Again, she needs support to catch the function of the dice, throwing counters and cards onto the table until with gentle cues she begins to throw the dice, But when her memory cards are read out to her, she is transported with joy, back to happy childhood times. Face creased into smiles, she recalls loved favourite dolls and then mimes to us how she makes beautiful bead necklaces as a child and wears them around her neck. Now very alert and engaged, she proceeds to initiate follow-up conversations with other players; something unobserved up to this point. We observe in each woman connection stimulation engagement interaction and joy. The care-givers accompanying these women both appear more relaxed and are now able to throw themselves lightheartedly into the game-play. Consensus is that ‘Este Soy Yo’ (THIS IS ME) is very suitable for people with early stages of memory loss and has perhaps a wider general relevance in helping individuals with less capacity to engage in a social activity by learning a simple task. Participants like the idea of playing again, of intergenerational game-play, of looking backwards and forwards on life and of creating alternative game-strategies and memory prompts from the materials. With the second game ‘Tu Y Yo’ (YOU AND ME) we feel very supported in the knowledge of our shared difficulties and concerns and the mutual trust generated during the game is both palpable and deeply emotional. It is observed, (very similar to the Nottingham PPI experience)that participants are needing to share both joy and tears within their game-play.An interpreter explains that people are feeling free to express pain, to cry, to share, to be understood, to be heard and held within the heart of the group. Is it the coming together of shared experience within safe spaces that allow us as a group to reach out so openly to one another? These games surely act as a catalyst to unlock experiences perhaps lost, denied or deeply withheld. Game-play is effective in allowing mindful examination of questions needing to be asked, pasts wanting to be appreciated and futures waiting to be lived. Abundant written feedback and photographs are gathered to document contributions in words, gestures and expressions. Audio and video recording further capture a wealth of vibrant communication and commentary. Game-play finishes with a beautiful mindful exercise from ‘Living The Life’(Good Life Kit) where we all close our eyes and appreciate that we are valuable people who deserve to be loved; with this affirmation we each give ourselves a warm hug, before slowly opening our eyes and coming back to one another for gentle goodbyes, kisses, hugs and handshakes. 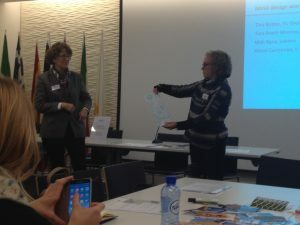 In January, Dutch colleagues worked together with German colleagues on planning and delivering the evaluation of the Good Life Kits in the Netherlands. In this Mind secondment, visiting colleagues helped finalise the protocols for the evaluation of the Good Life Kit, and helped to prepare and host a further PPI group session where the Good Life Kit prototype was introduced and protocols discussed, and which offered a great opportunity for discussion and socialising around the issues raised. 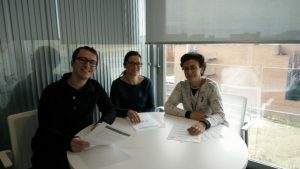 Colleagues from Italy, Germany and UK worked with INTRAS Foundation partners to present MinD project at the International Conference “Application of mindfulness in the work with people affected by mental and neurological diseases” at Universidad Europea Miguel de Cervantes (UEMC) in Valladolid, Tuesday 20thof November. The second session was about MinD project with presentations from Kristina Niedderer, Michele Zanasi, Alessia Macchi, Julie Gosling and Binta Jameh. Raquel Losada and Rosa Almeida from INTRAS participated as chairs persons. 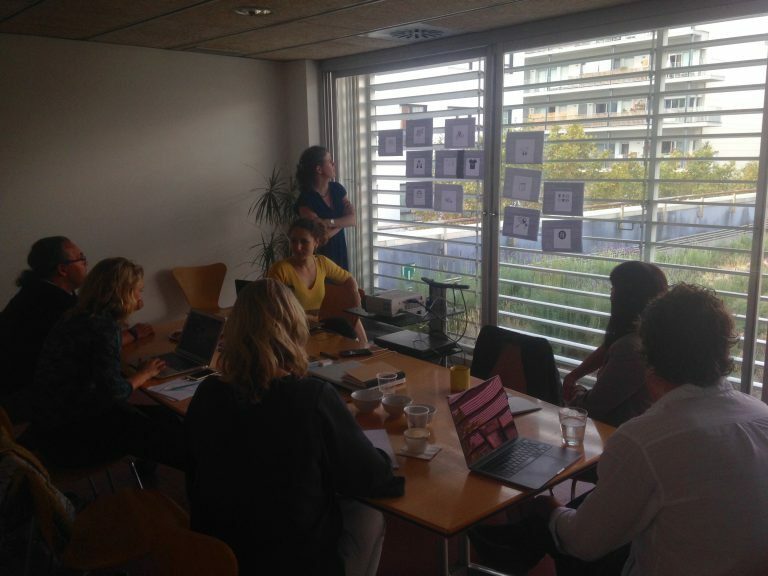 In this secondment, colleagues from Intras joined colleagues in the Netherlands to help finish specifications for the Dutch and Spanish prototypes of the Good Life Kit and to prepare protocols and materials for the evaluation in Spain in the next secondment. Although the secondment officially was scheduled for two weeks only, due to researchers availability, colleagues from the Netherlands started already the week before with work on the Good Life Kit – namely translation of all parts into Dutch language – and on publications. 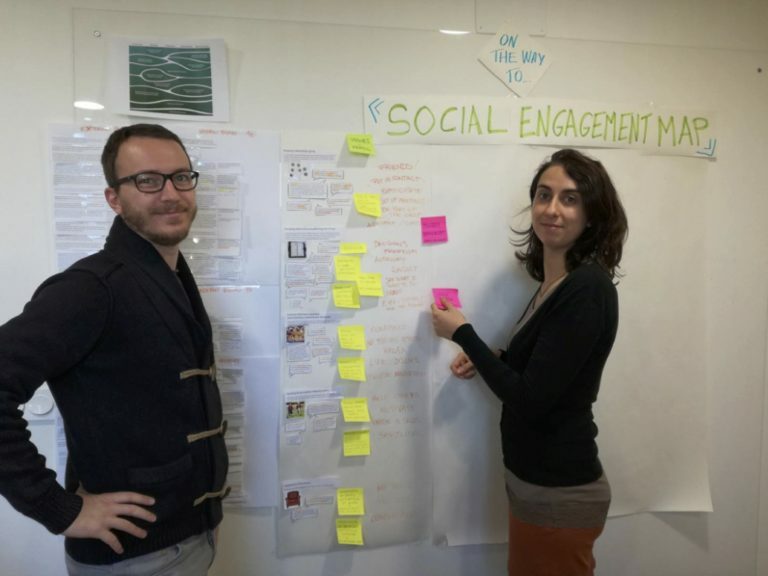 The main part of the secondment was given over to bring together the different strands of work on the Social Engagement Map and to unify them into one tangible and feasible prototype. Alongside this work, there were also external activities, such as attendance at conferences and to present and learn from others’ work. 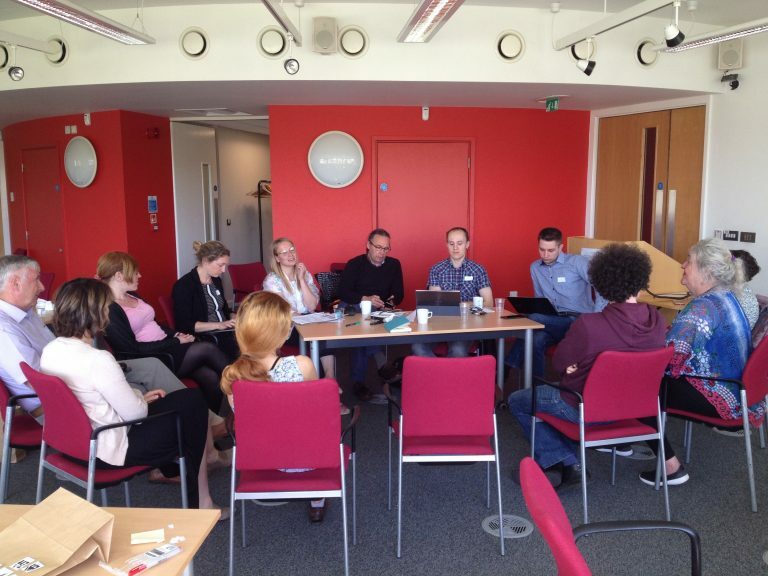 In October 2018 MinD Research Team are met in the United Kingdom to work on “Social Engagement Map”. 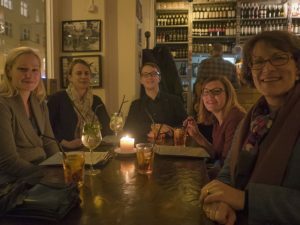 Researchers from Twente University, Netherlands, Nottingham Healthcare NHS Foundation Trust, Dresden University, ITMO university St Petersburg and Intras, Spain met in the Nottingham and Wolverhampton to continue the work on the design ideas. 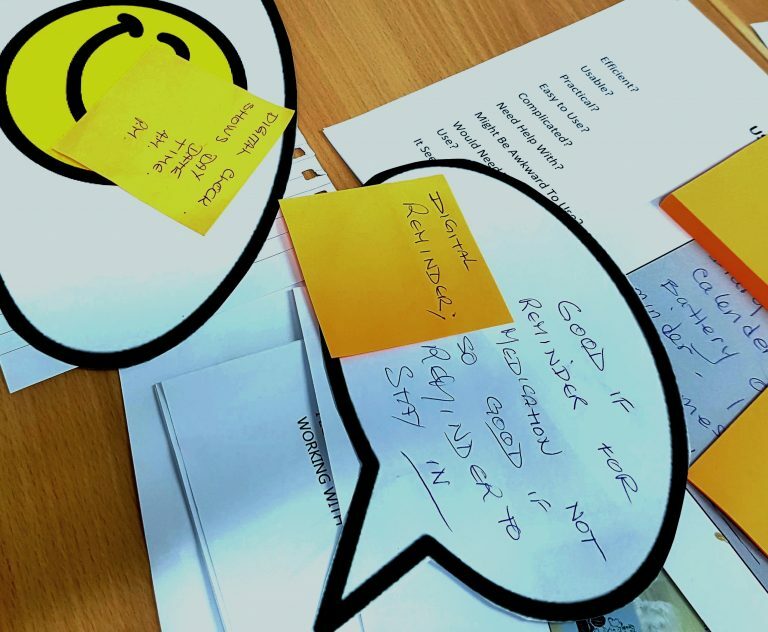 During this secondment a shared co-design session was held with people with dementia and caregivers from the Nottinghamshire Public and Patient Involvement Group (PPI). 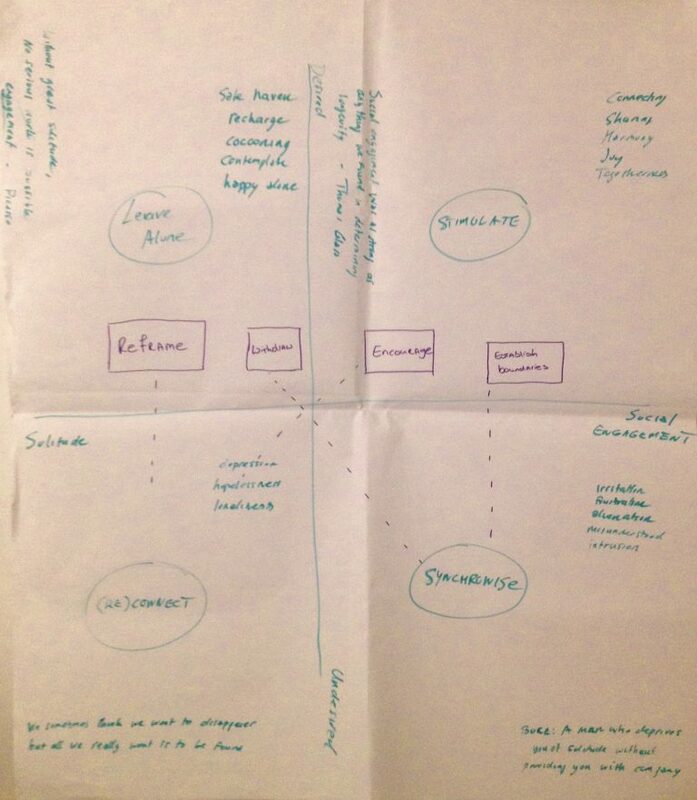 The aim was to explore the functionality and aesthetics of the Social Engagement Map design proposal from a user perspective so the designs can meet their needs and expectations. On October 3rd, researchers, persons with dementia and caregivers all turned into co-designers and spent the day learning ones from the others. Diverse activities were conducted to collect information about the needs perceived and the way that this technology could help on them. Some new aspects of the designs were shown, so researchers could get a new input on how they are perceived. As with the previous PPI events in March and May, the activities enabled all its participants to work with confidence and create a good cooperation atmosphere. The information collected on the PPI group guided the researchers work during the rest of the meeting. Social Engagement Map design was modified to integrate the concerns of the users about usability and aesthetics while colleagues from ITMO worked on the programming for the Social engagement Map. 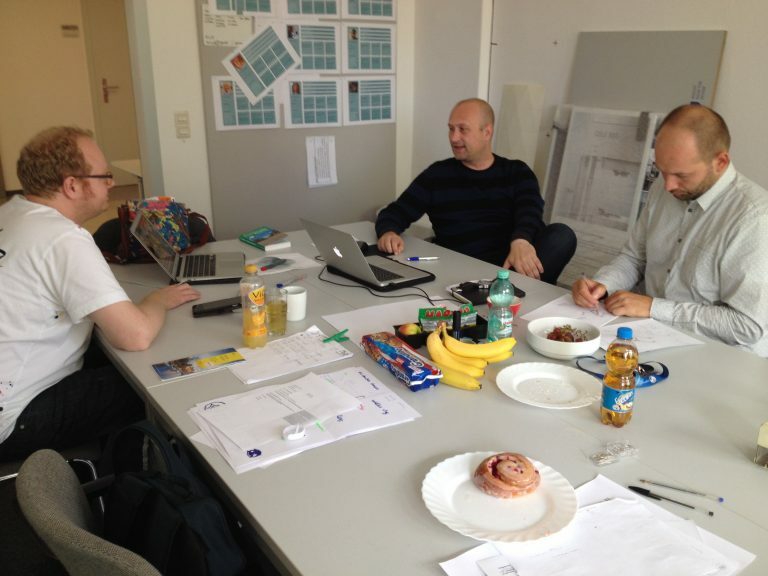 The last days of the secondment were dedicated to work on the evaluation procedure for the designs. Users experience evaluation questionnaires were developed, so a quantitative analysis can be conducted on SEM and GLK, complementing the qualitative approach that is already available. 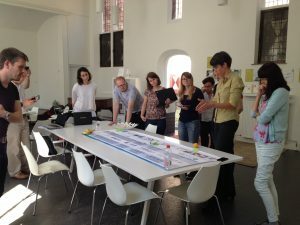 Following on from the secondment in Germany, colleagues from the MinD team met in the Netherlands to take up the baton on completing the design realisation of the Good Life Kit and the Social Engagement Map. The 8 researchers were hosted by University of Twente, Panton Design and by Zorggroep Sint Maarten. 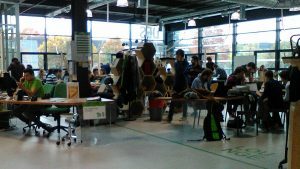 The secondment had three key tasks: firstly, to complete the concept of the Good Life Kit and hand it over to students from U Twente for the production of the prototypes in four languages. Secondly, to refine the concept of the Social Engagement Map while colleagues are already working on the programming for the realisation for its prototype. Thirdly, members of the group worked on revising and refining the framework for evaluation the prototypes in the next step of the project. 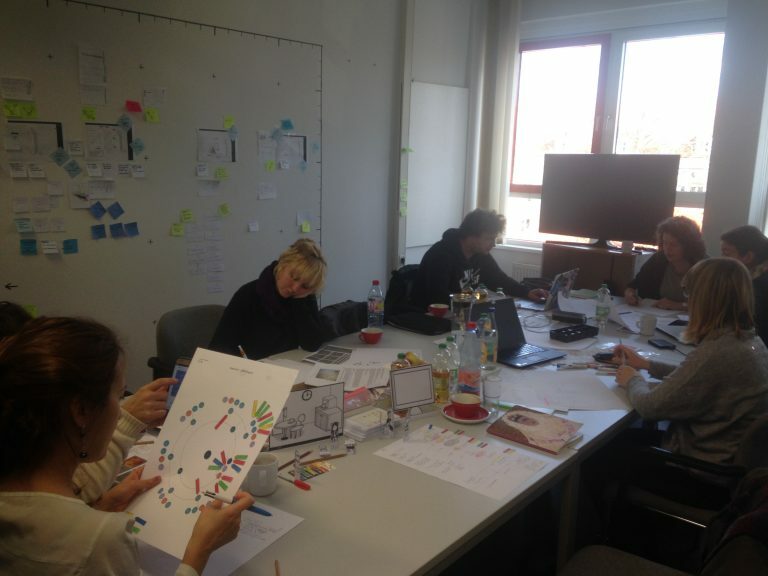 After the summer break, the MinD team met in Germany to continue their work on the realisation of their design prototypes, The Good Life Kit and the Social Engagement Map, and to prepare for the evaluation of the designs. Colleagues from Italy, Spain, Russia and the UK worked with the Alexianer St Hedwig Hospital, Berlin and TU Dresden. Daniil continued programming for the Social Engagement Map, and Elena and Teresa worked on developed the concept for the user experience further. Raquel, Teresa and Kristina worked on improving parts of the Good Life Kit and also on its translation into German and Spanish to enable evaluation in the different countries. 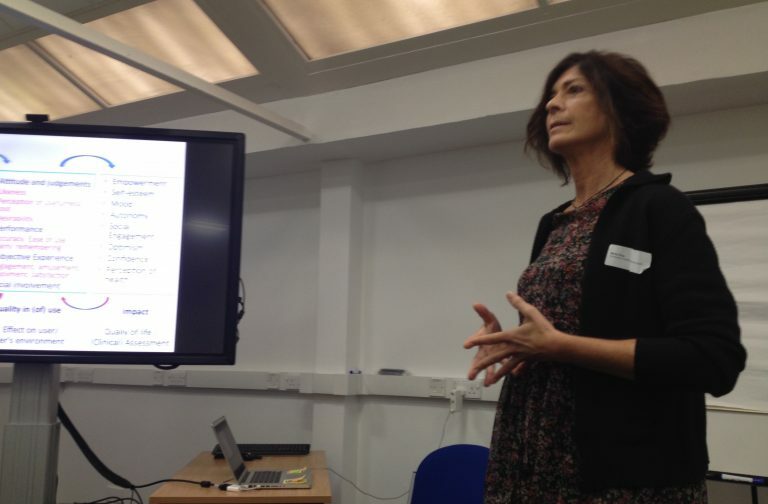 Raquel and Teresa also planned the practicalities of the evaluation with people with dementia at INTRAS. Work was further completed on publications: Kristina continued work on the mindful design framework paper, and Teresa, Raquel and Elena prepared a poster on the MinD project work for presentation at the AAL conference. 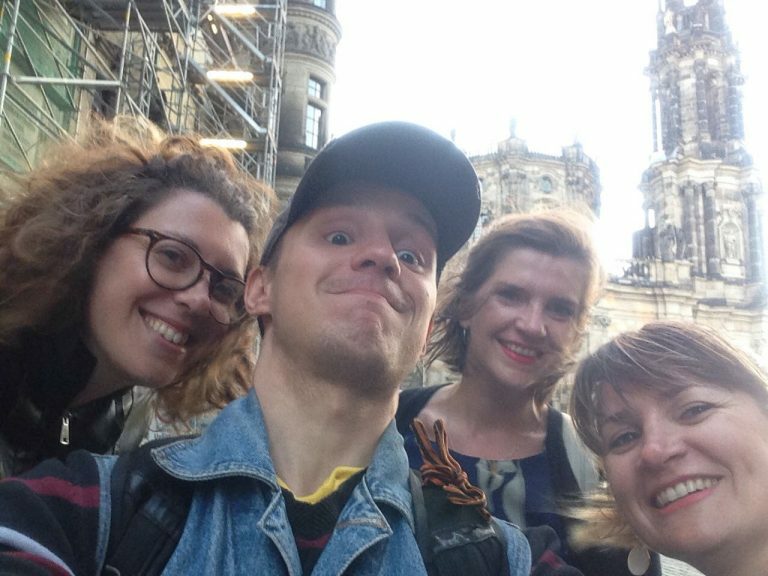 The group also made time for socialising with two lovely dinners, in Berlin and in Dresden, promoted by the warm and sunny weather. 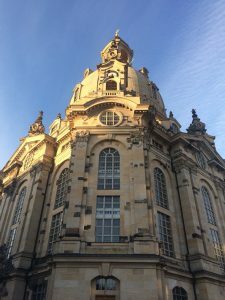 On the last Friday of the secondment, Christian from TU Dresden also took the group to an exhibition in the historic part of Hellerau in Dresden, for a historic walk and to see a design exhibits from the County’s Design Competition. In the end of June, beginning of July 2018, colleagues from the MinD team have met for the third time in Luxembourg. 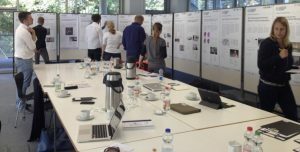 University of Luxembourg and Alzheimer Europe hosted visiting researchers from Germany, the Netherlands, the UK and Spain, to finalize design ideas and prepare for their evaluation. This secondment stretched over three weeks. In the first week, colleagues form Alexianer St Hedwig Hospital and Wolverhampton University worked on preparing a funding application for submission, to complement and extend the work of the current MinD project if successful. The application was submitted early in the second week. The team worked on the design development of the ‘Good Life Kit’ design The Good Life Kit aims to support people with dementia in managing everyday life confidently. The design concept had been selected in October 2017 from a shortlist with the help of people with dementia, caregivers and healthcare experts in Germany, Spain and the UK. 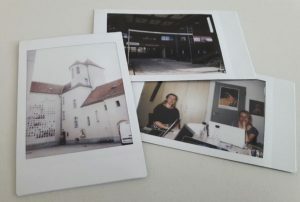 A key task now was to finalize the design concepts of the three different parts of the Good Life Kit so that prototypes can be prepared over the summer for the evaluation in the autumn. The three parts are: This is Me, Living the Life and You & Me. This is Me offers reflecting on one’s past present and future and to think about experiences, feelings and values, and abilities and wishes. Living the Life offers information on one’s health and how to keep well following mindfulness principles. You & Me offers reflecting on and putting in place one’s own support team to face the challenges of dementia. A second key task was to work on preparing a framework for the evaluation of the designs in the next phase of the project in the autumn. The intention is to present the designs to people with dementia, carers and health professionals in the four countries: Germany, Netherlands, UK and Spain. The evaluation will assess the potential benefits and impacts of the designs. The secondment was characterized by intense work to get crucial parts of the project completed before the summer break but also by social and jolly times, including the football WM, splendid food and Luxembourg’s beautiful scenery and culture. 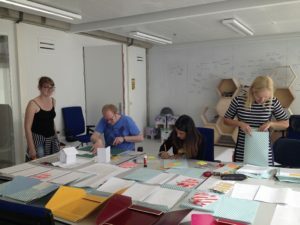 At the first working week, held in Alexianer Hedwigshöhe Hospital, from 11 to 15 June, the Berliner partner Vjera and Kristina worked on the feedback of the PPI group on the Goodlife Kit presentation of the last secondment, in the UK. The team of programmers from Russia (Daniil R and Daniil G) in partnership with Kristina worked on the progressing of the visual layout (game board and cards) of the Good Life Kit further. Daniil G started to prepare the server side for application of the SEM, entering mock data to feed the prototype. 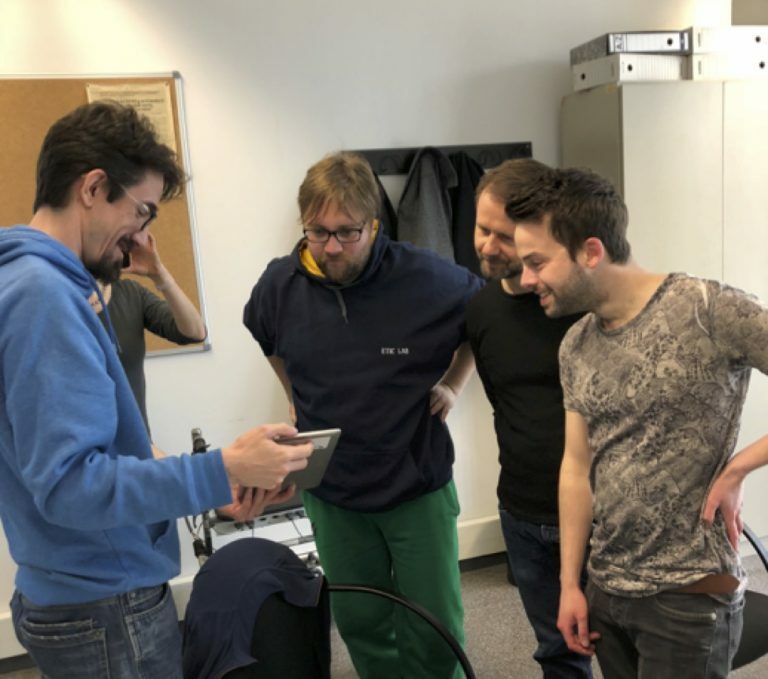 At the end of that week, the whole group moved to Dresden, at the TU Dresden facilities, to continue the design and programming work on the prototypes of both: Good Life Kit and SEM. 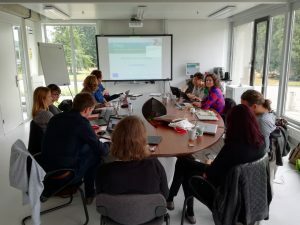 On Friday, the 15 June, the team with the help of the Dresdner partners discussed about what the missing data / information are necessary to design the SEM. Questions like: Which contacts to add on the program, how to add activities and places and who are going to fulfil this information at the program were discussed. Following the second week, on Monday morning, Lisa made a presentation of SEM: upgrades and proposition on “how it could work”. During this second week, the design team, Elena and Michaelle started working on SEM, especially on visual aspects of each function/page. They tried to make a recap of all the functions in a sort of flow chart of the process and to imagine the user the first time that opens SEM: how does it work at the beginning? how can he/she (or his/her relatives) insert data? The programmers team, Daniil G then continued to work on the server side for application, to make the prototype work. Finally, Daniil R worked on improving the front-end of SEM to make it work better, especially on the function of “dragging”. The following days, the designers continued the work on the fine details of the SEM. They have prepared a mock-up of different pages, starting from the previous draft designed in the UK and discussing technical aspects with Daniil G. Lots of other aspects came up for improvement. For example, the difficulty in insert so much information about each person, places and activities which could make the task boring and tough. Probably it will be better if we find a funny way, like a game, a quiz or a questionnaire, to fill in the different information. The presentation of the layout design needed to be fitted on the design criteria for design for PwD. Finally, even in a small group, but not less motivated, we focused on improving the two design projects. It was a very dynamic, challenging and exchanging secondment with a lot of work, good Italian coffee, musical festival at the evenings and laughs after all. 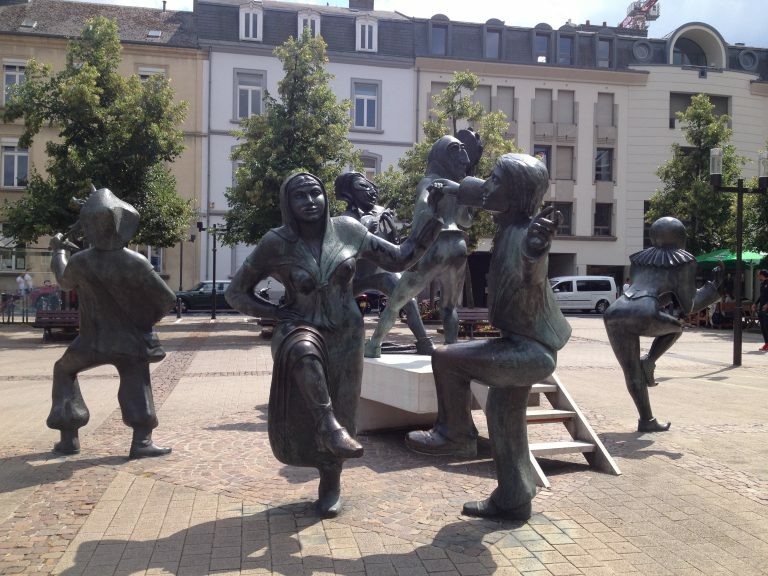 We just want to send our project further to the secondment in Luxembourg, wishing it´s going to be as lovely and full of motivation like this. During this visit, colleagues worked at the two hosts as well as during joint meetings. The MinD team (together with our hosts) worked on the design development of the two design ideas selected with the help of people with dementia and healthcare experts in October 2017: The ‘Good Life Kit’ and the ‘Social Engagement Map’. The team worked in two separate groups on the two design ideas, but met in regular intervals to discuss their ideas and progress. During the design work, designers, technologists and psychologists from the MinD team worked together to develop the format and content for the different parts of the designs. The team created visual examples and models to discuss how the designs will look, how they will work, and when and how they can be used. Colleagues from UPC shared design project solutions, such as CaregiverPro, from their own related projects with MinD team colleagues by way of mutual support and knowledge exchange. 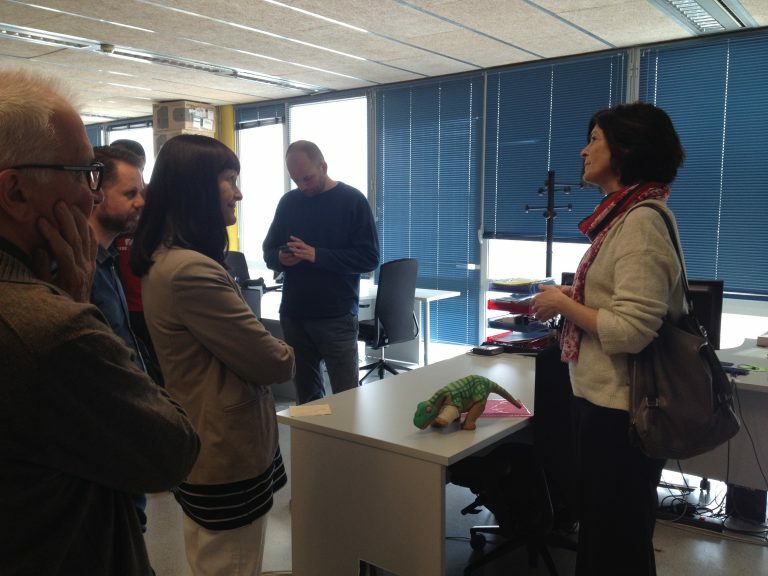 At the visit to the Vilanova Social Robotics Lab, Andreu and Marta showed the team through the Social Robotics lab and explained the various projects concerning Parkinson’s disease they are / were working on as well as other projects and work, including work with robots (robot dinosaur Pleo) to help children with emotions. For this secondment, Michele from Alexianer St Hedwig Hospital, Germany, Geke from University of Twente and Marta from University Politechnico de Catalunya visited the University of Wolverhampton and Nottinghamshire Healthcare NHS Foundation Trust, UK. During the secondment, colleagues variably worked independently at their respective locations or together to work on the publication of the data collection results from Phase 1, and to prepare for and consultation with people with dementia and carers from the Nottinghamshire Public and Patient Involvement (PPI) Group about the ‘Social Engagement Map’, one of the project’s proposed designs. 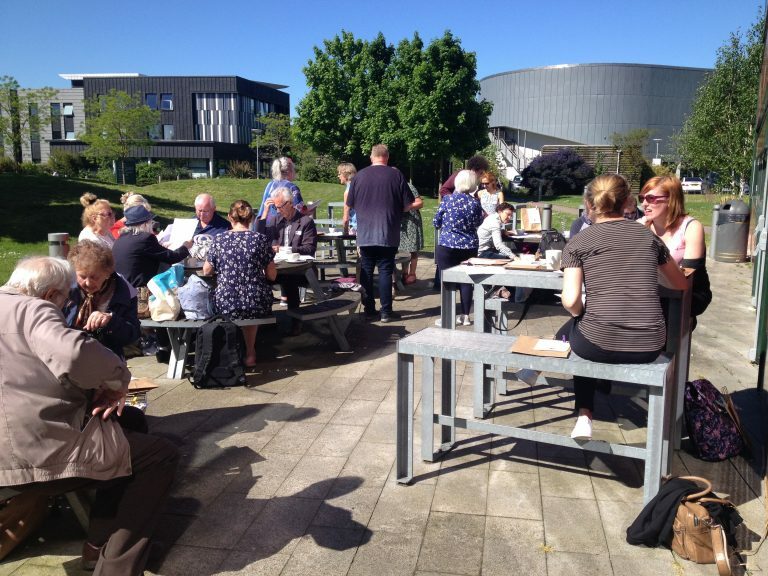 The ‘Social Engagement Map’ aims to support people with dementia to stay socially connected and engaged, and in control of their social life. The design concept had been selected in October 2017 from a shortlist with the help of people with dementia, caregivers and healthcare experts in a number of PPI sessions in Germany, Spain and the UK. On Monday, Julie and Marta worked together on reviewing the design concept and protocols for the co-design sessions and evaluation. On Tuesday, Marta, Michele and Kristina met for to go over the design concept and the questions designers have with regard to usability, and for which they wanted to seek feedback through the PPI group. While Michele worked on the publication of the earlier project results from interviews with people with dementia and carers, Marta, Geke, Julie, Kristina, Dons, Mike and Sue worked over the next 6 days on preparing the materials for the PPI group, including preparing and agreeing on a suitable schedule, developing and preparing suitable co-working and co-designing protocols, and preparing the various materials for the daylong PPI session on Thursday 8 March. The PPI consultation in this secondment had two purposes: to help with the development of the design, and to improve our understanding of how to conduct co-creation processes with people with lived experience of dementia in order to develop the design idea in a way that is relevant and desirable to the people it is intended for. 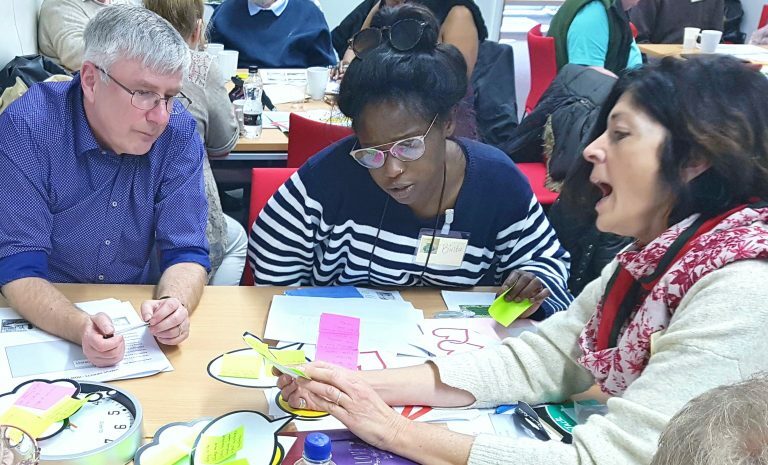 The PPI-co-design session at the Institute of Mental Health, Nottingham was attended by 20 participants, including 14 experts in lived experience of dementia and memory loss as well as MinD researchers, including psychologists, psychiatrists and designers. The day was conceived of as a journey together for all participants to enable sharing knowledge and experiences of lived experience and of designing. The morning started with sharing experiences, success and difficulties and gave voice to hopes and suggestions around socialising, recognising them as shared human issues. This was followed by a lecture about co-research with people with dementia, which all participants elected to attend. The afternoon commenced with picture slides of the project´s journey and a brief introduction to the nature and purpose of design. Groups brought familiar objects to consider how useful these were as memory aids and guides; what we liked about them, what was difficult, and what improvements we wished for. People with lived experience began to think like designers; designers began to see more clearly the lived-in world of memory loss. The afternoon finished with an introduction to the proposed Social Engagement Map with participants offering suggestions on improvements or variations that might be useful. A large amount of material was gathered, which is fed back to designers for further development now. On Friday 9 March, Marta, Julie, Kristina, Dons ad Mike met for debriefing of the session and worked on collating notes from the PPI session and the secondment overall. Colleagues from Alexander St Hedwig Hospital in Berlin visited the University of Wolverhampton in January and early February to work on publications of the data collection from phase 1, and to help with the preparation of materials for co-design sessions with people with dementia in March. Having made much progress with developing the design concepts into tangible ideas in November and December 2017, it is now important to involve people with dementia and carers in the design process. We will involve people through co-design sessions, where we will work together to decide about which features to include in the designs as well as about how the designs should look and work to suit them. It is very important to have the views and experience of people with dementia guide the design process to make our design fit for purpose. The work on in January and February focused on preparing the design ideas for presentation in the co-design sessions, which included preparing visuals, translation of English texts into German for the German participants, and determining relevant areas and questions for the discussion in the co-design sessions. 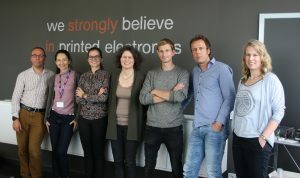 In February, three colleagues from the UK and Luxembourg where hosted by the three partners in the Netherlands for a week to work together on the preparation of these materials, on finishing the report for the work on Work package 3 (Data collection 2016-17 and theoretical dementia care framework). 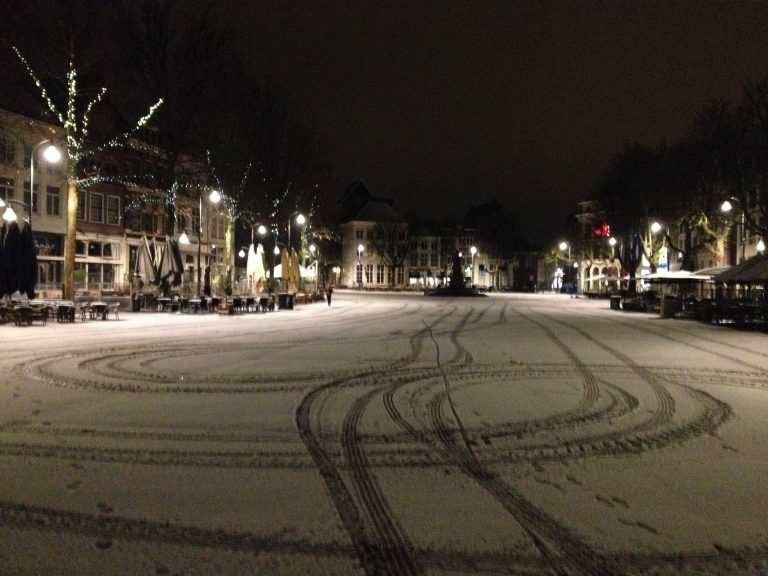 They also worked on forward planning, including future development of the work and the minD conference planned for September 2019.
being accommodated in Pant’s lovely guest house, colleagues prepares soups from the convenient ‘soup boxes’ to keep warm in the winterly conditions in lovely Deventer. For secondment 19, visiting researchers from Italy, Spain, Luxembourg, The Netherlands and the UK where hosted once more by TU Dresden and by Alexianer Hospital, Berlin. The aim of the secondment was to work on the concept development and realization of the two design ideas selected with the help of people with dementia and healthcare experts in October: The ‘Good Life Kit’ and the ‘Social Engagement Map’. The ‘Good Life Kit’ will help people with dementia to deal with their condition constructively and openly, especially at the point of the diagnosis when there can be a feeling of loss and uncertainty about the future. The ‘Social Engagement Map’ aims to help people with dementia stay socially connected and engaged. It responds to findings that elderly people in general have fewer social connections, and that people with dementia in particular may find it difficult to maintain or establish social connections. 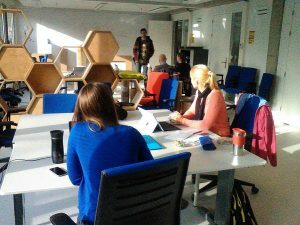 During the first week of the secondment, the visiting researchers met at TUD where they were looked after and supported by staff and students in the design development work. The hosts had prepared printouts of the initial ideas, and provided various creative materials, leading to some colourful modeling sessions. During the design work, designers, technologists and psychologists from the MinD team worked together to develop the format and content for the different parts of the designs. The team created visual examples and models to discuss how the designs will look, how they will work, and when and how they can be used. The feedback from the co-design and expert groups provided vital feedback to help further develop these ideas in the new year to make the designs fit for purpose. In the second week, the design work continued, complemented by the consultation with healthcare experts: one expert feedback session was held at the Alexianer Hospital to provide vital feedback on the two designs. In addition to the design development, visiting researchers gave presentations themselves, or offered feedback on student presentations. They also worked on the completion of th data analysis and publications related to the Dutch data collection. Michele was once more in INTRAS to work with the warm and friendly staff of the foundation. This time he was joined by the italian architect Alessia. The secondment began with an update of the projects of INTRAS. Alessia and Michele took part in a Snoezelen VR test with people with dementia, to test the new horizon of the sensorial stimulation therapy. It was amazing! 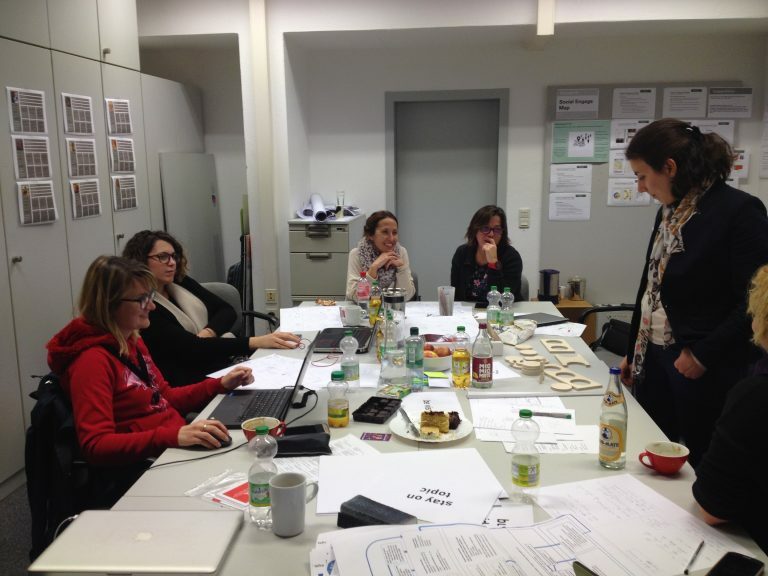 During the secondment, Michele worked on two tasks: firstly, translate and update the German coding tree into English. Accordingly, the coding of the Spanish interviews will still need to be adapted to this new version in the next secondment. Secondly, Michele worked on the literature search and review for the data collection publication. He analysed a large number of papers, part of which contained interviews with people with dementia, and provided an important comparision to our work! Alessia worked on planning and driving two co-design sessions with users and attended many consultations with professionals for the design development. She focused on the ‘Social Engagement Map’ design and summarised the information received into a schematic flow diagramme, which made the importance of involving persons with dementia directly in social activities as well as the main role of relatives in that process really clear. Also, the need to adapt any new device to a familiar and reassuring environment to reduce rejection is essential. 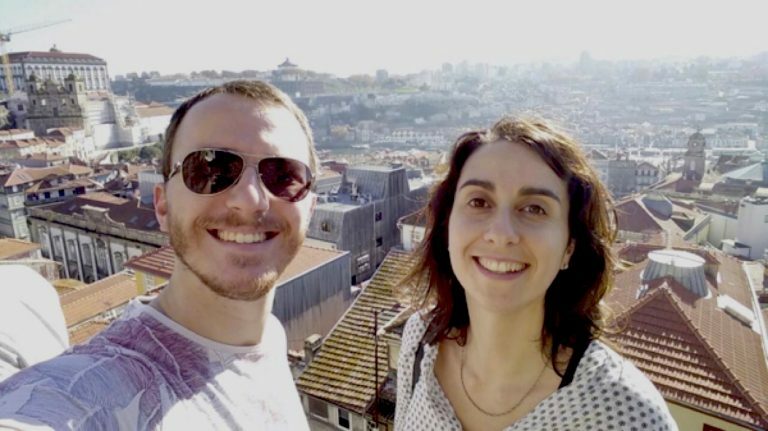 At the weekend Michele and Alessia enjoyed the beautiful and warm town of Porto, with its amazing architecture and delicious food. Visit 18 started with a recap session and with a clear focus on two targets: the final discussion on the 13 design proposals through a PPI and a management meeting to select between 4-6- to be developed during the next months, and the kick-off of the work package on Evaluation (W6). 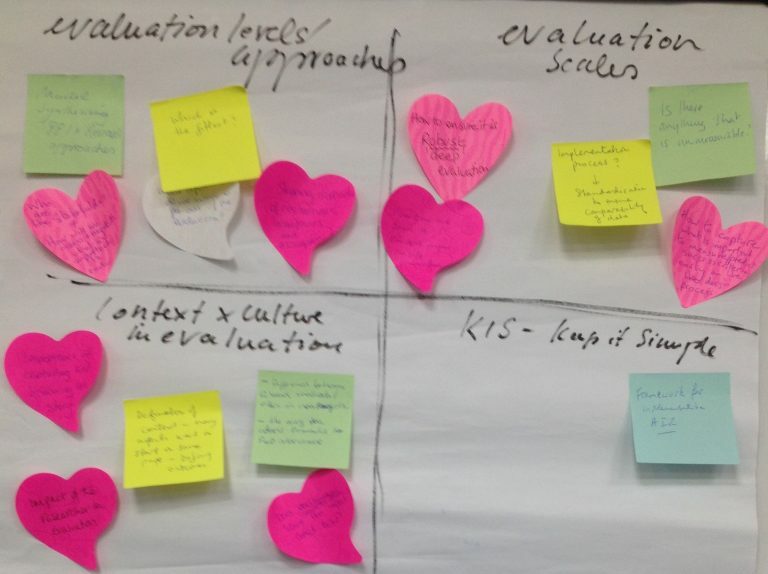 In the first week, we prepared the two central events in this secondment: the third and final PPI workshop (18 October) of the design idea assessment phase and a workshop on “Soft Evaluation” with the participation of external experts. Discussions about methodologies for co-production and co-evaluation started the work on WP6, and included considerations of assessment tools (e.g., Psychosocial Impact of Assistive Devices Scale) and how to adopt such approaches for the evaluation of designs with people with dementia. To elaborate further on co-production methodology, the team wrote a draft protocol about the values and principles underlying the co-design as a base for further discussion on how to implement the co-design approach. Preparing the PPI workshop, in both weeks one and two, aspects such as the number of participants involved, as well as the co-production process and session structure were discussed. Efforts were put into creating a friendly atmosphere for openness and shared ownership while addressing the always challenging recruiting and other practical issues. A guide for facilitators and a program for the sessions were carefully designed based mainly in small group dynamics, including an inspiring ice-breaking activity conducted by Julie Gosling. 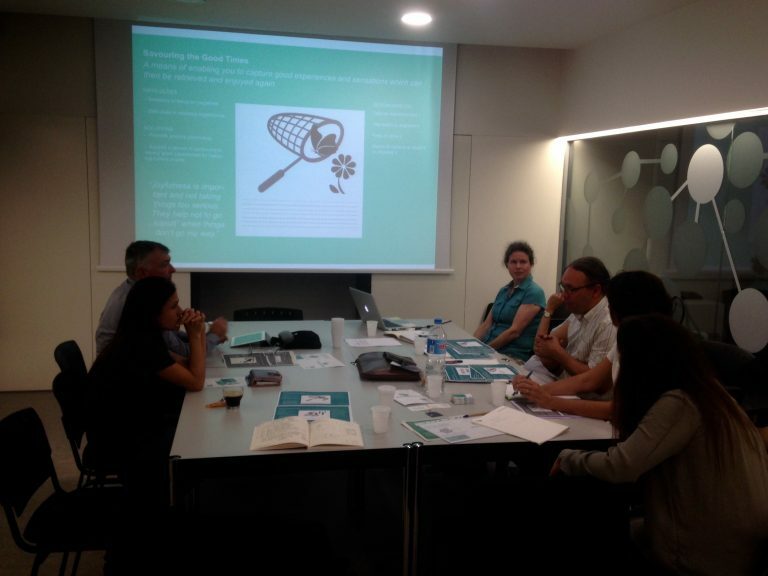 The second week began with the continuation of the work about evaluation and report/papers writing. The PPI session took place on Wednesday, 18th October. Seven people (5 people living with dementia, 2 caregivers) from UK attended the morning session to discuss in groups the 13 shortlisted design ideas information on which was sent to them in advance. Some of the participants stayed in the afternoon for a skype meeting with a colleague from Alzheimer Europe and a member of the European Working Group of People with Dementia. The session was very rewarding and a success both in terms of togetherness and in terms of mutual understanding. 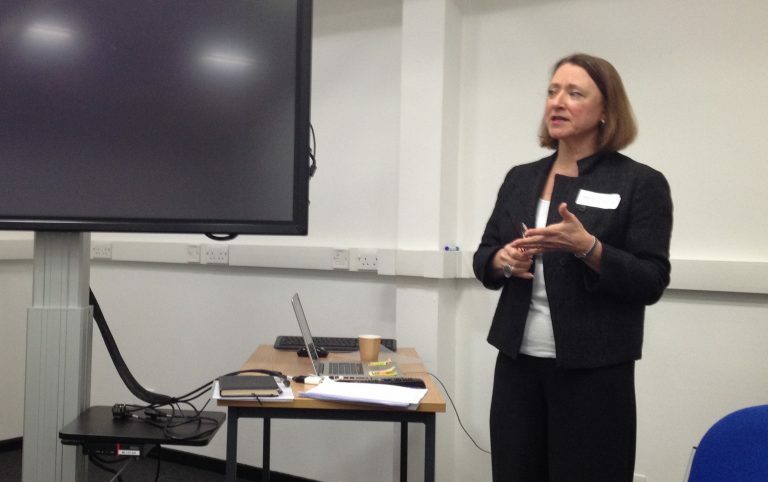 The soft evaluation workshop on 19th October allowed discussing the topic of qualitative evaluation and strengthened links with researchers with similar interests. It offered an excellent opportunity for liberal, stimulating and insightful exchange of perspectives and work. It thus provided a great starting point for WP6, the evaluation work package. A take-home thought was the challenge to find a balance between the project’s humanistic approach and the need to gather and report evidence based outcomes. Time in week one and two was also dedicated to writing the WP3 report to the EU commission and journal papers to publish the results of the data collection phase that took place in Year 1. Finally, a management meeting took place on the last day . 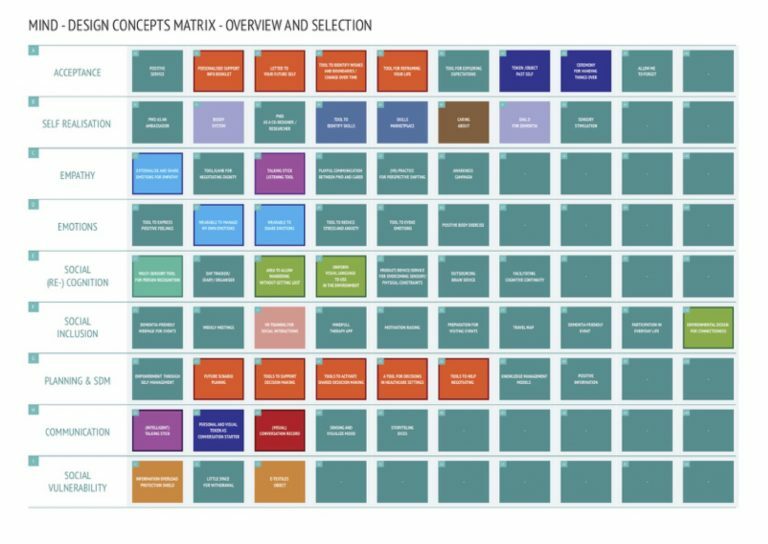 It importantly allowed the team to decide on which design ideas (grouped in two clusters) to take forward to realisation and how this will be managed (which partners on which secondments). Thus, an important milestone of the project was reached. Exchange V17 in beautiful Barcelona saw a combination of inspiring brainstorming sessions, further developments of design concepts for transition areas 4-7, and considerable progress in terms of paper writing (WP3 paper on the visual diaries, and WP5 paper on environmental design for dementia). Central to this visit were transition areas (TA’S) 4-7, dealing with issues ranging from coming to terms with emotions, maintenance of social participation, shared decision making, and communication. After starting out with the whole team, we split up in sub-groups and worked out specific ideas into design concepts, with each transition area taken on by two- or threesomes. Midways in the 2nd week, we reunited as a group and reviewed all concepts in terms of fit with MinD (To what extent do the concepts target mindfulness (empowerment) and social engagement? ), originality (What do we add to things or solutions already out there? ), impact (Do we really feel that this is us, and can we make ‘headlines’? ), and feasibility (Can we really do this?). A preliminary ranking of ideas emerged with, amongst others, design concepts for ‘shared decision making’ (How to engage in mindful and respectful decision-making regarding roles and responsibilities of PwD and carer? ), ‘a social engagement map’ (mutually informing PwD and his or her social network about activities, events, and needs), and the ‘good life kit’ (the potential ‘package’ of the selected ideas) scoring high. On Thursday afternoon, these ideas were presented at an expert session in which Marta Sanchez (Mental Health Cluster), Josep Vila (Alzheimer’s Catalan Foundation), and Joan Ribas (Germanes Hospital, Psychogeriatric coordinator) and colleague Eva acted as expert panel. Ideas focusing on a ‘social engagement map’, a ‘shared decision making tool’, a ‘what I can do’ service, and a ‘ritual tool’ for handing over responsibilities were enthusiastically received, others were harder to explain and grasp may need more refinement. Once more, on a general level, the importance of acceptance and openness about dementia (by the PwD) at a very early stage surfaced as a crucial hurdle to take. Based on the developments made during this visit, and the feedback session, in the next visit further design developments, selections and additional feedback sessions with different stakeholders will follow. 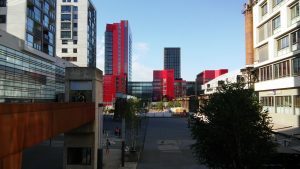 Exchange 16 was dedicated to the design phase (WP4 and 5) of the project. 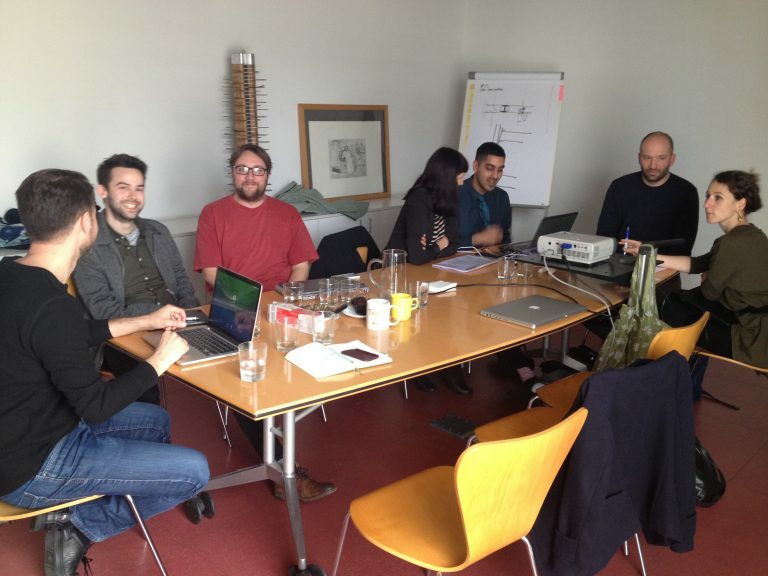 For the first week, the working group was hosted by the Alexianer St Hedwig Klinik in Berlin. 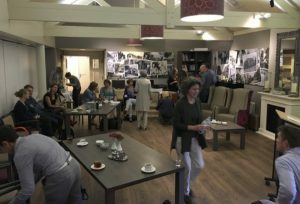 The team explored more deeply three of the transition areas developed in July in The Netherlands, concerning diagnosis and self-value, the wish to be able to help others, and the importance of meaningful activities. The team developed fourteen design concepts in response to these transition areas and prepared them for presentation to a group of experts. On Thursday, 7th of September we met experts related to Alexianer Klinik: an occupational therapist and an informal carer who also works for Alzheimer Berlin. After a very short presentation of the project and participants from Prof Dr Vjera Holthoff-Detto, Prof Kristina Niedderer and Jun.-Prof Jens Krzywinski presented and explained the ideas. Then the experts discussed and assessed them. They also gave some suggestions to merge some of them. Based on these discussions, we were able to merge 2 concept ideas from Transition area 2 then 13 ideas remained for the next week. 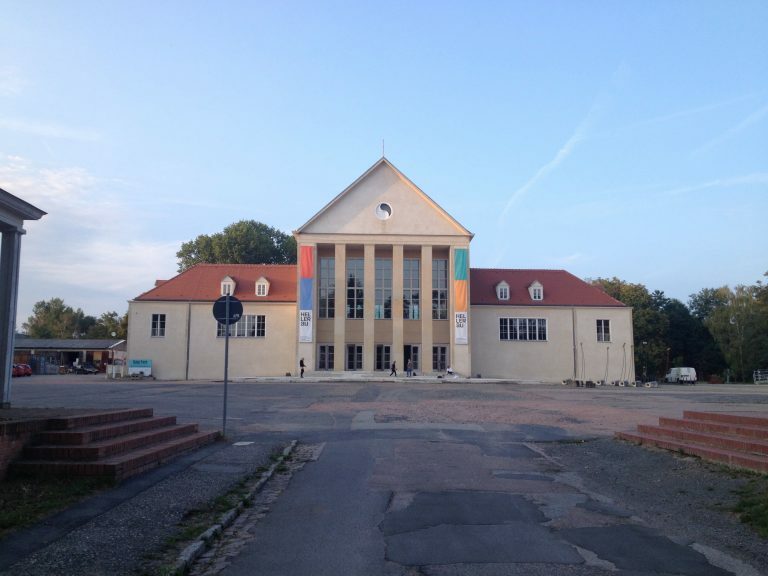 During the second week of the secondment, we moved to Technische Universität Dresden. The team aimed at taking one step further to narrow the concepts. In other words, the work was more about designing some specific ideas. First of all, the working group assessed the 13 remaining concepts based on 11 criteria, 5 about the feasibility and 6 about the interest of the concept idea itself. Based on this assessment, we were able to select 6 ideas and then a vote allowed us to keep the 4 (3 from the Transition area 1 and 1 from the Transition area 2) for deeper development. On the following days, we worked in smaller groups to develop these design ideas: Positive Services, Guide for life, “Guardian Angel” and Filter out. The discussion led to some interesting developments. Spontaneous support from further colleagues from Dresden University was very helpful especially about the furniture part of the “Positive services”, the “Guardian Angel” and a potential App for “Guide for Life” topics respectively. Visit 15 was once more dedicated to the design phase (WP4 and 5) of the project as well as to the European Commission Mid-Term Review meeting. For the first week, the group met at the design lab on the beautiful campus of University of Twente, in Enschede. 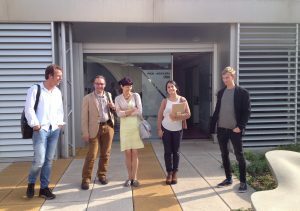 The team presented successfully the Midterm Review of the project to the representative of the European Commission. The second half of the week was dedicated to work on the design development of the project. Our main task was to revisit and develop the previous work already done in the secondment in Barcelona, relating the design themes derived from the data collection and the mindful design topics derived from the initial design development. The grid was used to relate and visualise where the data – i.e. quotes of persons with dementia and caregivers from the data collection -, existent design projects and MinD design ideas are located and overlap. During the second week, we moved our activities to Panton Design at Deventer, which is based in a medieval building sited at an historic city. We carried the work across to Panton Design in order to work further identify the transitional areas where the designers could focus. “Transitions” are clusters of quotes, existing designs and design proposals that emerged during our previous work at Twente. 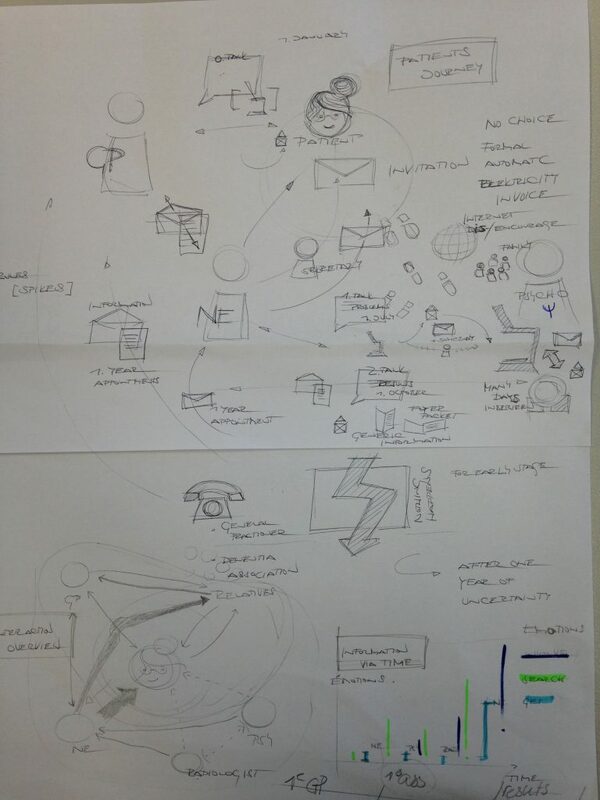 Guided by Panton, the team also developed personas and looked at scenario planning related to the transition areas. There were, over the two weeks, four internal presentations. In the first week Guillermo Benito and Yolanda Bueno from Intras Fundation were presenting the qualitative results from the Spanish data collection. 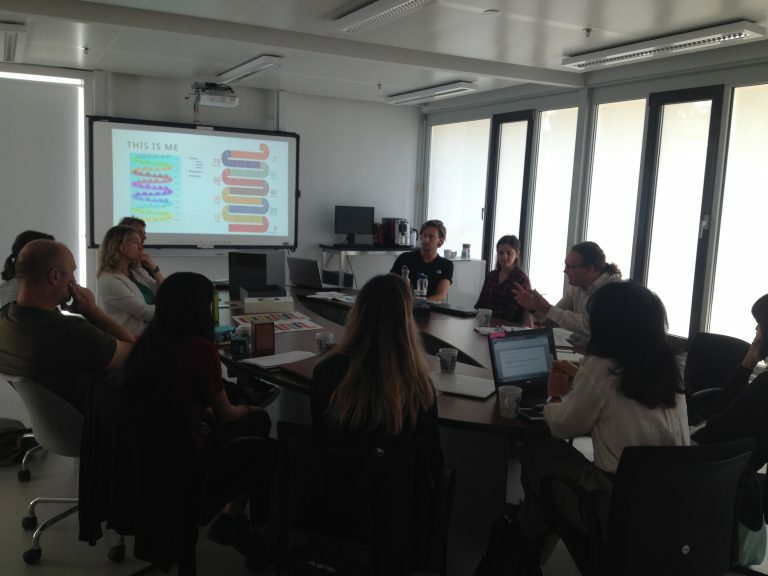 The second week followed with the presentation of the findings of the PhD study of Michaelle Bosse from TU Dresden, about “how to introduce the Mindful Design Approach to design students”. Kathrin Büter presented her PhD research on “Dementia Friendly Hospital Architectures”. And the last presentation was from Alessia Macchi from Duit on “Designing for an Autism friendly emergency waiting room in the Carreggi Hospital”. 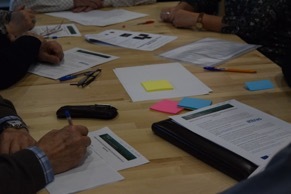 On Thursday 6 July, we held a workshop with external experts on dementia to show them the current state of our work and collect ideas, opinions and comments. Prof Kristina Niedderer gave an introduction to the MinD project. This was followed by the keynote of Prof Tischa van der Cammen, from Delft University on design for ageing. After lunch, participants were divided into two groups to comment on some of the project data and developments, and to join in the design development. 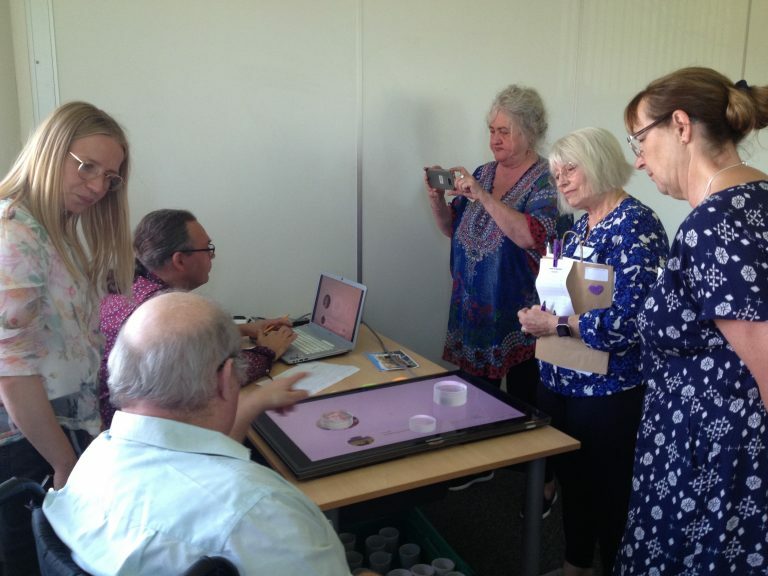 For this purpose, participants were presented with work sheets, with profiles of “personas” – examples representative of different groups of persons with dementia and carers – and with the descriptions of the transition area and related quotes. The tasks generated lively discussion and great results offering public engagement and contributions to the MinD project as well as knowledge transfer for participating experts and students. During this secondment, Berit Ziebuhr from Alexander St Hedwig Kliniken, Berlin, worked at the University, UK to enable her to continue with the detailed data analysis of the German data for her doctorate and to provide further details (quotes and expanded coding tree) for the design phase. Berit analysed in detail a further 7 interviews, During her stay, she was supported by and had regular talks with Prof Niedderer. 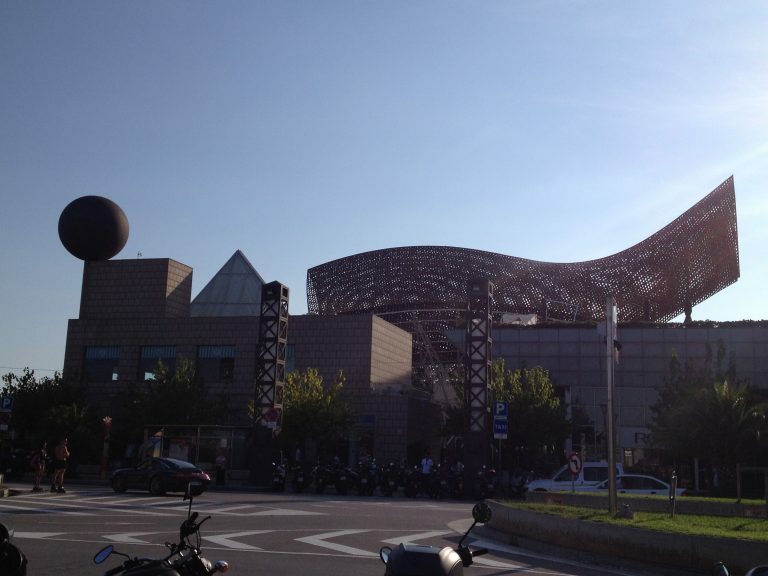 Visit 14 in beautiful Barcelona was devoted to start of the main design phase (WP4 and 5). The visit saw a combination of inspiring meetings and visits, organized by our very welcoming new partner UPC (Universitat Politècnica de Catalunya), and of a continuation of brainstorming sessions on design concepts at both UPC and Picharchitects; this time with a small group of designers and researchers from the UK, Germany, Spain, and the Netherlands. The first week started out with presentations, visits and demonstrations, ranging from a visit to a centre for testing out existing solutions for elderly people with disabilities, to a visit to the hi-tech Research Centre for Dependency Care and Autonomous Living in Vilanova. 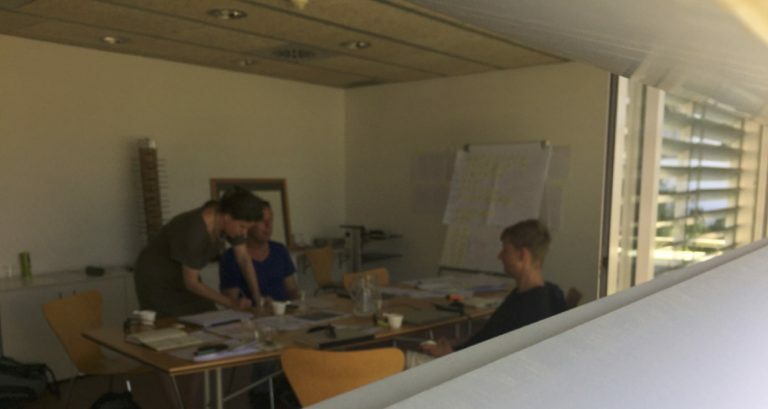 The second week was fully devoted to brainstorming and design idea development, and we were thrilled to have Zuzana Prochaskova from PICH architects with us as well as Marta Diaz from UPC. To elaborate on our approach a little: we started out from the design topics (developed in Luxemburg during the previous visit from the data collected with people with dementia and carers); we used this information to brainstorm on mindful designs – spanning the range from the first diagnosis meeting to problems encountered in social interactions later on. For instance, can we assist people with dementia with future planning, or help them with person recognition, and if so, which types of products, services or environments do we have in mind? We considered projects both related to the individual as well as environmental solutions for assisting people with dementia. At the end of the second week a large range of design concepts had been developed, to be refined, discussed and elaborated on in the visits to come, starting with the one in the Netherlands at the end of June. It is great to see things (or should we say ‘designs’) taking shape at the start of the second year of MinD. Now that the beginnings are there, we feel confident when saying that certainly the best is yet to come. Muchas gracias a todos, goodbye Barcelona, we’ll be back! 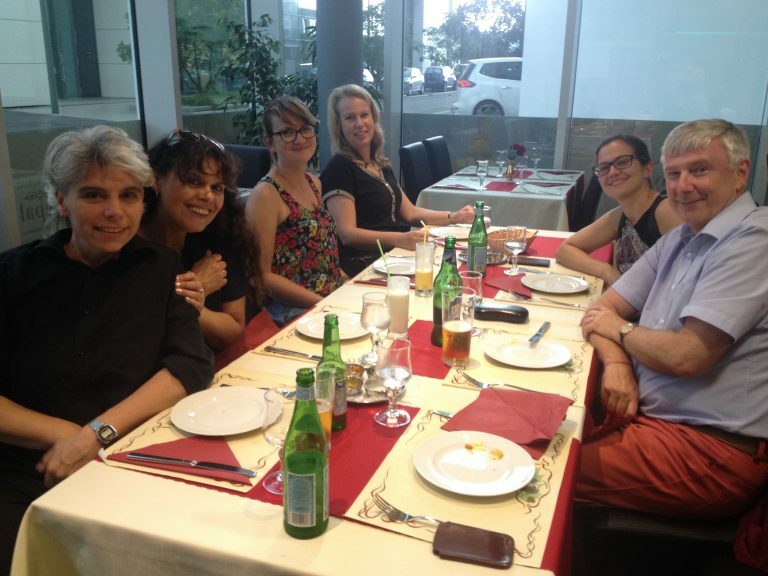 12 researchers took part in Secondment 13 and were hosted by the Universite du Luxembourg and Alzheimer Europe. The overall plan and aims for the secondment were to bring together the results of the data collection (part of WP3) from year 1 of the MinD project and to discuss the results to identify and define relevant points for the design interventions from the data to take forward and respond to in the design secondments. 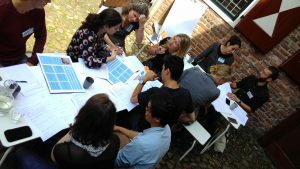 In the first week, participants presented the results of the data collection in Germany, the Netherlands and Spain, and analysed it to identify common themes. Analysis and refinement of the themes continued during the second week. 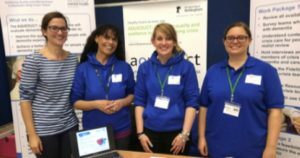 The website was developed to include pages about patient and public involvement, to make it easier for people with dementia to find out how to take part in the project. A management meeting took place, starting discussions about the project mid-term review which will happen in June. On Monday 15 May, the team worked with Alzheimer Europe’s contact group, the European Working Group for People with Dementia (EWGPWD). The purpose was to present and discuss the results of the data collection phase as well as get feedback on (a selection of) design themes identified through the data collection. The day offered the opportunities for very lively and insightful discussions and was appreciated by all participants (incl. the researchers) because it enabled first-hand experience and discussion, and an amazing opportunity for knowledge sharing. 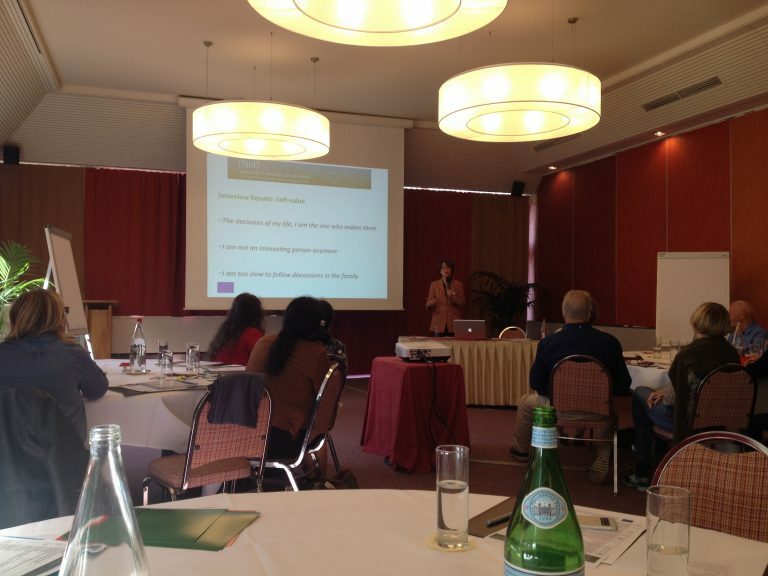 Michele was once more warmly welcomed to INTRAS and received an update of the projects of the foundation. 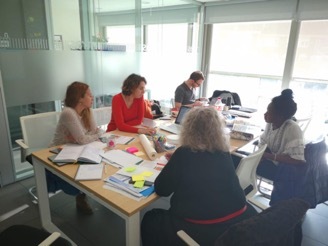 The secondment then was given over to two tasks: firstly, coding and analysing the interviews with people with dementia as well as carers that had been conducted in Spain. Secondly, colleagues from INTRAS and the visiting researcher collected the MIND visual diary/activity books from participants and talked with them about the experience filling it in. Colleagues The overall plan and aims for the secondment were to learn about data analysis and analyse all then prepared the diaries for passing digital copies to MinD colleagues for analysing them during their secondment in Australia. Other highlights during the visit were a workshop promoted by the Centre of Reference for Alzheimer’s (Salamanca) where 4 cases receiving music therapy intervention were presented including some dynamic exercises for the attending professionals. 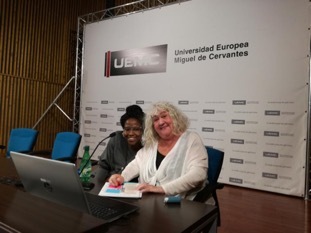 Esther García Valverde, the expert in music therapy in dementia explained the humanist psychological approaches she uses with regard to promoting wellbeing and communication, centred on the person and their capacities for creation and Self-realization. The interviews coded during this visit were conducted in Spain in November 2016, they involved 6 people wit dementia and a focus group of caregivers. Reading them provided initial insights about issues such as the importance that people with dementia gave to still being useful and active in their life. It also highlighted the importance of their social support networks, for example through caregivers and the friends. Caregivers, in turn, emphasised the lack of support for people in the early stages of dementia, and both sides felt that additional professional care would be helpful while the use of design was still mostly alien to them and largely associated with technology for use in the later stages of dementia. The overall plan and aims for the secondment at Queensland University of Technology (QUT) were to learn about data analysis and analyse all diaries/’do-books’ from the data collection. In addition, the aim was to complete a number of papers relating to work packages 2, 3 and 4 for the dissemination of the project work and results of the first year. 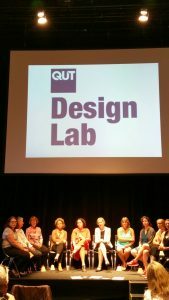 Further participation in an international symposium and Designing for Dementia was planned as well as presentation of the work to students at QUT. The first few days were given over to the arrival, settling in and getting to know staff at QUT. 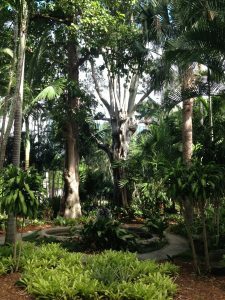 The hosts took the researchers to see some relevant exhibitions on living in aged care as an introduction to some of the cultural sites and the work about dementia and aged care at QUT. Researchers also prepared their presentation for the symposium the following week, discussing the process of coding for the diaries and developing the coding scheme, relevant coding programmes. The second week was given over to the participation in the symposium, the coding of the Dutch and German diaries, and the work on several papers on mindfulness and the data collection and design methodologies. The symposium was a great success with 12 international speakers, including the MinD team, other colleagues from QUT, from Sydney and the UK, and from Canada. The symposium was attended by approx. 170 delegates (including the speakers), many from professional backgrounds (architects, formal and informal carers and healthcare professionals), which made for a great audience and lively and enlightening discussions, which highlighted progress in the area of the presented work as well as much need for further research. The third week focused on coding and analysis of the Spanish diaries as well as further paper writing. The MinD researchers also presented the MinD project work to a group of about 40 final year design students who were very much interested in some of the methodological and conceptual aspects of the work. 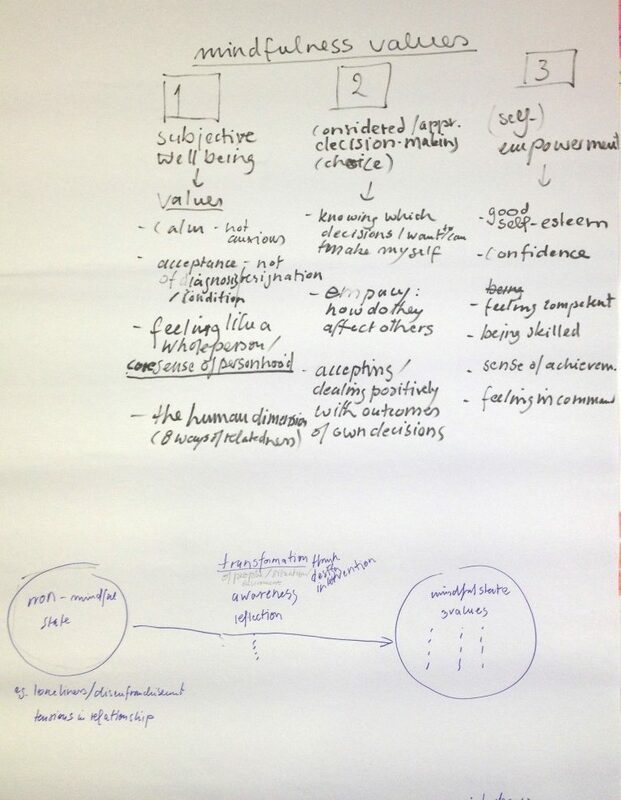 Week 4 was given over to discussion of the different ways of analysing and communication of the coded data with regard to qualitative and quantitative analysis techniques, and the relevance and significance of the different approaches for the aims of the study. Qualitative thematic analysis was discussed as important for insights and the emergence of themes with regard to recognising problems and gaps in managing daily and social living for people with dementia, and hence to offer intervention points for design. Quantitative methods such as analysis of co-occurrence etc. can be used to insure validity of coding, significance of findings/themes, etc. With regard to quantitative coding, researchers learned about other analysis programmes (Noldus Observer), which had been used by QUT researchers to code and analyse data of a small early design study. Time was given over also to discussing and writing up the results. 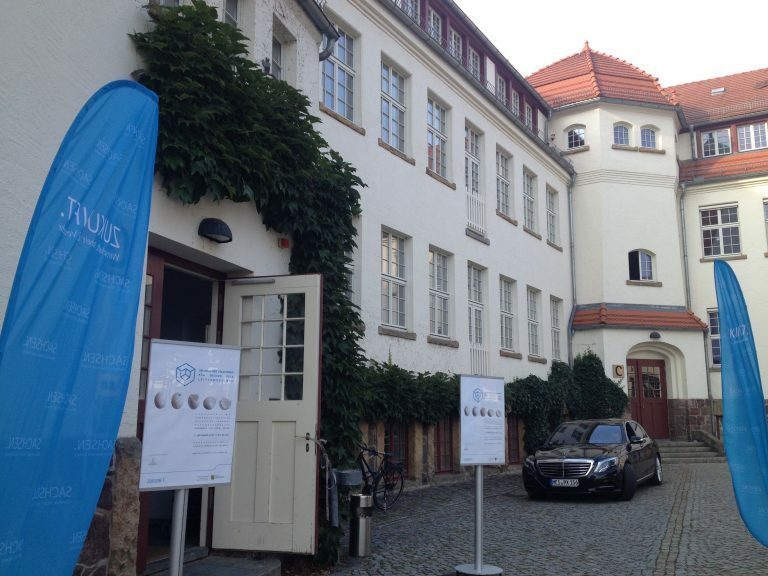 The latest MinD visit took place in Berlin and was hosted by St. Hedwig Kliniken, Alexianer Krankenhaus Hedwigshöhe (Prof. Dr. med. Vjera Holthoff-Detto). This time, the visit really centred on interview analysis (Julia and Thomas) and paper writing (Aleksandra, Isabelle, Julia, and Thomas). The interviews coded and analysed during this visit were conducted in the autumn of 2016 in the Netherlands, and involved people with dementia and their carers. Analysing the data was a very insightful journey as it allowed team members to actually step inside the shoes of “people with dementia and their carers, and thus to get an insider perspective. Apart from getting to know about their struggles and delights encountered during daily activities (such as shopping and going for a bike ride) and social interactions (such as visiting neighbours and meeting others at the supermarket), what emerged as really important for people with dementia and their carers in experiencing and coping with dementia was the social-psychological factors such as personality, social support, empathy, and openness towards others. For instance, a high need for control makes it difficult to hand over control as a patient progresses through the stages of dementia, and might bring about additional marital problems between partners. Openness and willingness to talk about dementia also surfaced as crucial. That is, to experience social support in one’s environment (rather than just within the walls of one’s own house), a willingness to talk and be open about dementia is important. Additionally, the interviews showed examples of cases in which an unwillingness to let other people know were very energy-consuming, aggravating fatigue and weariness. These are just a few examples of what the interviews brought to the fore, but it does show why it is so important to conduct them and give a voice to people with dementia. Interview analysis will continue, and results from the Dutch as well as the German and Spanish data collection will be compared to see how the German, Dutch, and Spanish interviews differ and/or overlap. Are there cultural differences in terms of, for instance, social and professional support? Do the same problems and issues in activities and social interactions arise? And what about support tools people use? Things mentioned during the varied from large scale calendars, print-outs of pictures of products to be bought at the supermarket, to a newspaper on the table throughout the day to tell date and time. Meanwhile, paper writing focused on establishing a mindfulness framework, analysing environmental interventions aimed at assisting PwD and to improve their wellbeing, and analysing research methodologies of relevance to our project. MinD continues in Brisbane, Australia, where the diaries that complemented the interviews will be analysed. What will they reveal about PwD and their ways of coping? 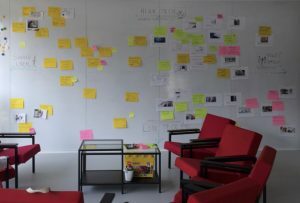 Together with the interviews and focus groups (one of them conducted here in Berlin during our visit by our wonderful Berlin hosts), they will provide the much-needed basis to enter the design phase of MinD. Last but not least, we had a wonderful time in the beautiful city of Berlin, this time including a dinner at an authentic Italian restaurant (thanks Michele!). Participants from Alexianer St Hedwig Kliniken Berlin and Fundacion INTRAS were hosted by University of Wolverhampton and Nottinghamshire Healthcare NHS Foundation Trust, respectively. The secondment was dedicated to advancing the work on the data collection phase, including discussions and workshops on public participant involvement in the project and on data analysis, and work on the literature review to contextualise the work undertaken. Of particular importance in this visit was the joint workshop with the Public and Patient Involvement (PPI) group at the Institute of Mental Health (IMH) to explore and get feedback on the mindful task based scenario analysis which the team will use to analyse the information gathered through the data collection phase to identify and develop opportunities for design interventions. 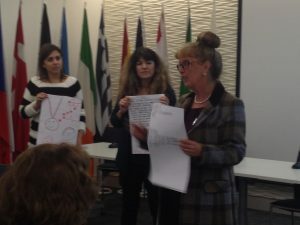 Also, a workshop on data analysis was conducted to share and develop knowledge on qualitative content analysis and jointly develop the coding tree for the analysis of the data gathered in Germany, The Netherlands and Spain form people with dementia and their carers. 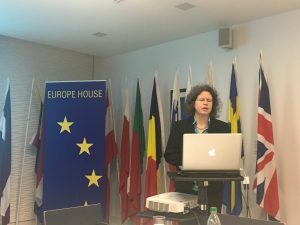 In the second week, the 1st MinD symposium was held at Europe House in London, which offered an opportunity for the team to review and present the work done over the 10 months of the project and to share the MinD project ideas with the public. The symposium included a keynote speech by Prof Cathy Treadaway, three presentations by members of the consortium (Dr Isabelle Tournier, Prof Vjera Holthoff, Prof Kristina Niedderer) about the different aspects of the project, a design brainstorming workshop, and a panel discussion. 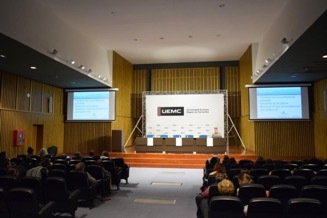 A summary of events of the symposium are available on the news page. The programme is available on the events page. 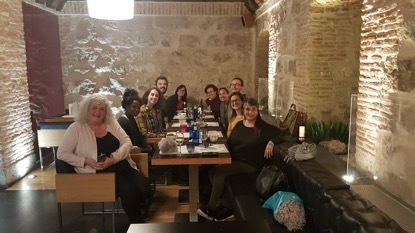 Participants from Alexianer St Hedwig Kliniken Berlin were hosted by the fundacion INTRAS in Valladolid to work on the data collection; training relating to dementia care and planning the next project actions. To begin with, participants took part in the CENTAC (National Congress of Assistive Technologies) where a lot of new technology and research programs to help ill people were discussed and presented. Contact and exchanges were made to many in the first days with psychologists, occupational therapists and many other professionals from INTRAS. In the CRPS (day centre of Zamora) there was a choice in taking part of different therapy and therapeutic activities with the patients of the fundacion. The participants also visited an IBIP Lab (Iberian Institute in Psycho-Sciences Lab), where many different and interesting research paths were compared and discussed to enhance new ideas and convergence of intents. Out of INTRAS centres, participants also visited CRE (Public Research Center for Alzheimer) in Salamanca; the visit was interesting and pleasant, the multidisciplinary approaches for the wellbeing of the patients are amazing! In the second week the participants prepared and conducted many interviews of people who have dementia and a focus group with caregivers. The sessions were really interesting and full of information. We are anxious to see the final report of the data analysis to compare them with the results of other countries. 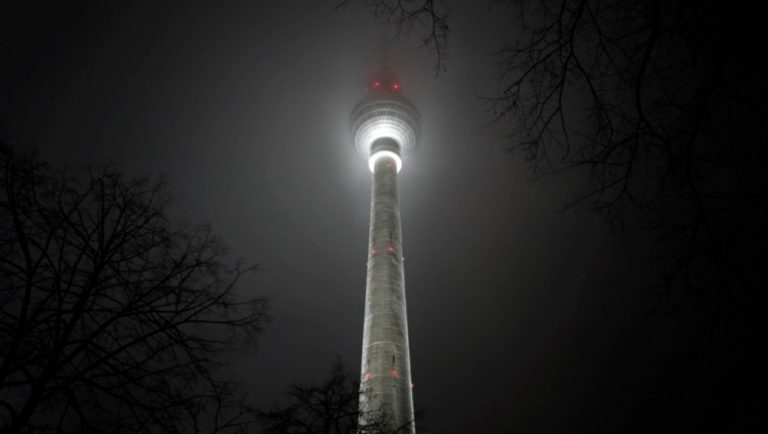 Some differences in Germany are already notable. During the weeks, research of previous literature about mindfulness, wellbeing and Dementia was conducted. We exchanged appreciation and thankfulness to our host, guests and people that we interviewed – people were really pleasant, interesting and productive. Participants from INTRAS Foundation (Spain) were hosted by Zoerggrop Sint Maarten with support from Twente University to work on the data collection with people with dementia and share experiences of care in Spain and the Netherlands. Visits to the Gerardus Majella nurse home for people with dementia of ZSM were made, to know the way that people with dementia live in a representative institution in the Netherlands. Gerardus Majella is a house for the elderly, 30 people with dementia live there, and they receive permanent medical and psychological care. ZSM also provides nurse home assistance for old people on the Twente region, integrated on a case management model. Four visits allowed researchers to understand the kind of assistance that people with dementia (and their care-givers) receive by the whole staff (doctors, nurses, psychologists and home nurses). Working meetings conducted with Twente University researchers allowed exchanging experiences on treatment approaches for people with dementia in both countries. Different health and social policies should be taken on account to understand daily life issues in each country. Researchers also worked on data collected on previous exchange visits of the project. Information from diaries and interviews was discussed. Several brainstorming sessions were held to identify new points of view in interpreting the available information. This way, ideas about possible lines of design emerged. The researcher also attended lectures on architecture for people with dementia and ethics on technological design and use. 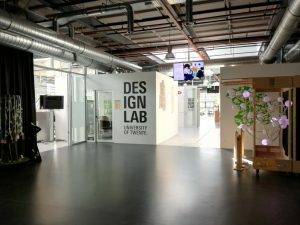 Research meetings were held at the Design Lab of Twente University, which is a truly inspiring place to think of new approaches to mindful design. New designs, and ways to work on them, are the basis of the work of students and teachers. We hope we can get a little of that and put it into our project! 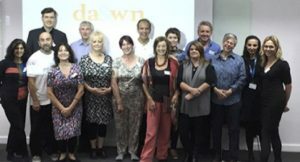 The sixth secondment of the MinD project ‘Designing for People with Dementia’ in October was the first secondment wholly dedicated to design. It saw a renewed discussion on the basic tenets of the MinD framework and its application through design. It provided an excellent preparation for the actual design phase of the project in 2017 through work packages 4 and 5, which focus on personal design and environmental design respectively to support people with dementia. 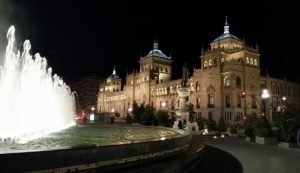 These discussions were supported by a series of inspiring presentations and visits centered on architecture and wellbeing and technology health applications, such as wearables and e-textiles through the two hosting partners in Barcelona. PICHARCHITECTS, a renowned architecture agency, and EURECAT, a major technology provider in Catalonia, who were the hosts for this secondment, presented their work and vision, and arranged for a series of insightful and inspiring visits in the city and in the Barcelona surrounding to give the group first hand experience of their projects and development and production facilities. The presentations and visits by PICHARCHITECTS fuelled discussions on the relationship between technology and nature, person and environment, and on their affect on human well-being. Visits included the Paideia School and several hospitals and care homes who support children and adults with mental health issues and also dementia. 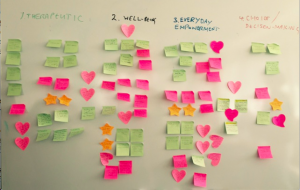 Alongside throughout the visit, based on the first findings of the interviews and focus groups, researchers and designers discussed the dynamics underlying social engagements (or the lack thereof), and the role of mindfulness. A core question identified was not only where do people with dementia experience a lack of social engagement and what potential strategies could be used to remedy this, but most importantly how social relationships and challenges associate with them can be transformed through mindfulness. These discussions allowed for a rich (mindful) understanding of dementia and the ways in which it manifests itself in everyday (social) interactions as a basis for the design development. As such, the MinD framework further took shape, and the potential roles of environmental design and technology really came to the fore under the influence of our generous and inspiring hosts. 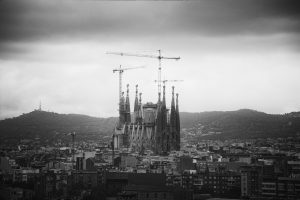 Needless to say, the Barcelona region provided the ideal climate for idea generation with its numerous (architectural) highlights, including the timeless Gaudi monuments. 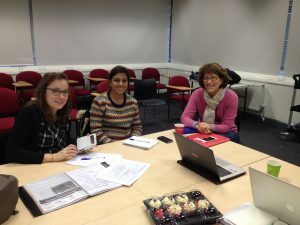 The participants of the MinD project were hosted by the University of Wolverhampton and the Nottinghamshire Healthcare NHS Foundation Trust (through the Institute of Mental Health) for working on the data analysis process, training relating to dementia care and for planning the next project actions. Professionals from Fundación INTRAS (Spain) and Alexianer St. Hedwig Kliniken (Berlin) were involved in a variety of activities including data analysis of the interviews previously conducted in Berlin, contacting and establishing synergies with different actions coordinated by the Centre for Dementia in Nottingham, like the PPI – Patient and Public Involvement Group and the DAWN – Dementia, Arts and Wellbeing Network, planning next secondments and the data collection activities to be initiated in November in Spain (Castilla y León Region). Other relevant activities included the attendance of different seminars promoted by the Centre for Dementia and the institute of Mental Health, with the goal of training MinD researchers in Holistic Care for Dementia, Social engagement, and Research methods. 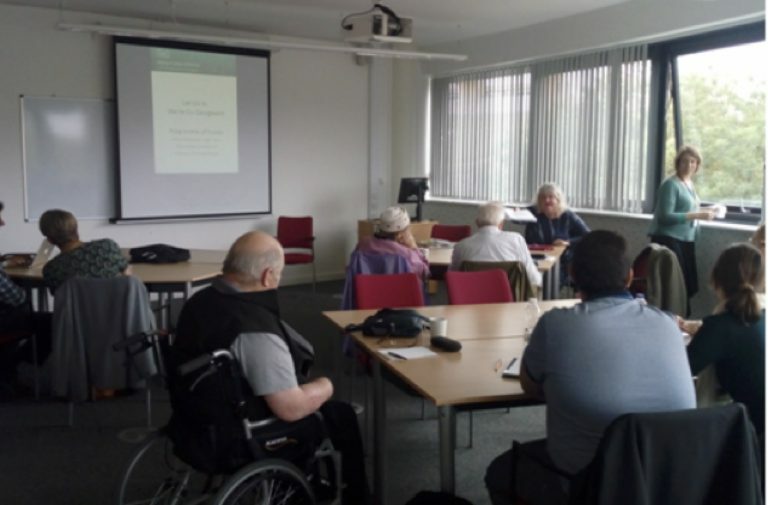 A presentation of several assistive devices for elderly people with dementia at the University of Wolverhampton emphasised the variety of these objects as well as the opportunities and restrictions designing them with a foresight of what is going to be there in the future. The analysis of the interviews carried out in Germany is under way. It promises important insights from participants with dementia and their carers about their daily life and subjective well-being that will feed into our mindful design phase. The project participants were delighted with the professional development opportunities, and want to thank the groups that opened their working sessions to us and to the MinD project. Participants of the MinD project were hosted by 3 institutions, Panton Design in Deventer, Zorgcentrum st Maarten and TU Twente in Enschede, for the two-week visit of the 4rd secondment between 19.09.2016 and 03.10.2016 in Netherlands. The first week, researchers visited all three partners to get to know them and to see dementia-care environments in The Netherlands. 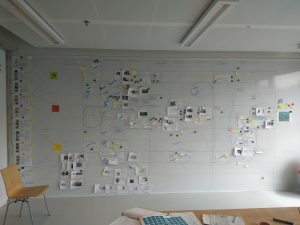 During this period, at the Design lab at TU Twente, the design team developed a state of the art “design for dementia” overview map of existing projects and assistive devices as a research background for the project. Also during the first week, the team completed all preparation for the delivery of the data collection in The Netherlands, and also finalised all data collection materials, including the visual diaries. 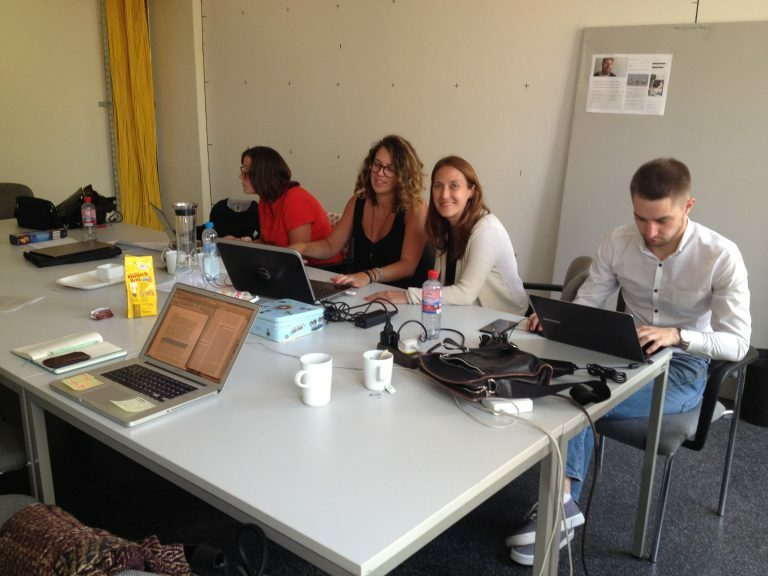 In the second week of the secondment, the team started with the data collection. Through hosts Zorggroep Sint Maarten, 12 people – people with dementia and their caregivers – had been identified and who were interviewed over three days by a team of care staff from Zorggroep Sint Maarten and of MinD researchers. In addition, the health care researchers of the MinD team were working on translations, papers and transcriptions of observation of the interviews during their stay. The design team, hosted by Panton, discussed the representation of the Mind project process and began with the generation of infographics for our Project workflow management. A design workshop for all the team gave momentum to the start of the design phase to start considering the main issues encountered by people with dementia and their carers, such as: (un)familiar environment, delivery of diagnosis, acceptance of the diagnosis and changing the relationships between the people who are involved in the situation. 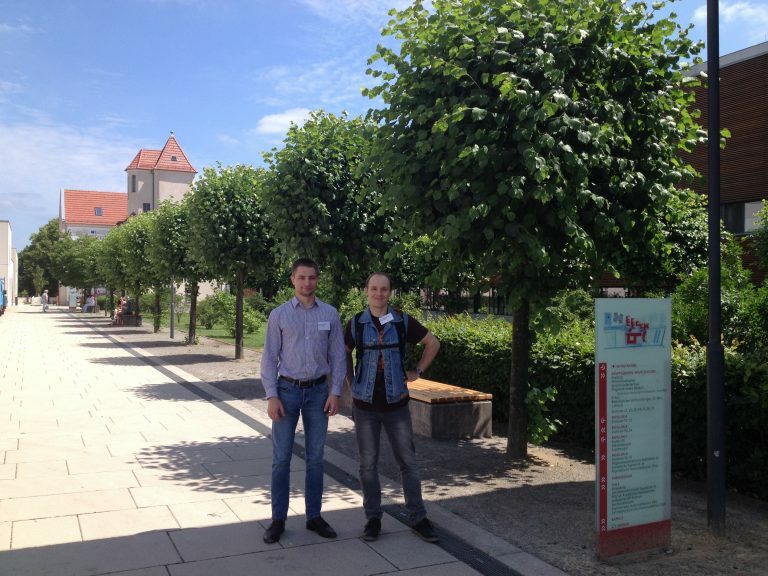 Members of the Mind Team travelled to Germany for the third exchange hosted by Alexianer St. Hedwig Kliniken Berlin (AKB) and TU Dresden (TUD). Participants attended for 2 weeks during the period from 29 August to 12 September. 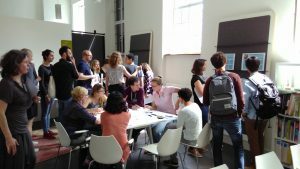 Five participants from four institutions (University of Twente, University Wolverhampton, University Luxembourg and Panton Design) took part in this exchange to work on the data collection. The first week started with an introduction to the MinD project and Mindful Design (Kristina Niedderer) for colleagues new to the MinD project, and a tour of the hospital by colleagues of AKB (Vjera Holthoff-Detto, Berit Ziehbur, Michele Zanasi), including the dementia wards and the drug rehabilitation ward. The tour provided important insights into the life conditions of people with dementia who are passing through short to long term treatment. The main part of the week was given over firstly to reviewing, finalising and getting ready all data collection materials (focus group interview schedules, information and consent forms, supplementing visual cards, and diaries). 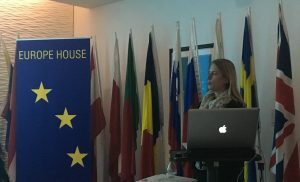 Secondly, the approaches and methods to be used for the textual and visual data analysis (Aleksandra Galasinska, Kristina Niedderer) were discussed, and presentations and training sessions on these were held within the group to share knowledge and expertise. – ‘Design methods’ (Christian Woelfel), including user experience design approaches, and relevant examples from TUD. – presentations by two student teams about the results of a three week short-term duration design project which took the MinD theme on designing for dementia as its focus. The working group also had the chance to visit the Center for Demography and Diversity (CDD) at the TU Dresden, with a presentation by the Prof Dr.-Ing. Gesine Marquardt on ‘Architecture for demographic change and dementia’, which reflected on the investigation of demographic change challenges, the transfer of research results, and projects concerning environment Design and Dementia. The data collection commenced with the first focus group on 08 September 2016 which was conducted with carers (spouses) of people with dementia. Further focus group and individual interviews will be conducted across four countries (Germany, The Netherlands, the UK, and Spain) over the next six months. 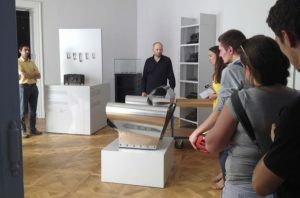 A presentation and guided tour in the Museum of Applied Arts, Pillnitz rounded this visit off. The talk by Dr Christian Woelfel was about the designer’s perspective of various exhibits, including materials and production technologies in relation to the formal aesthetic development of design. It was followed by a guided tour about the Deutsche Werkstätten Hellerau provided by Klára Nemecková. 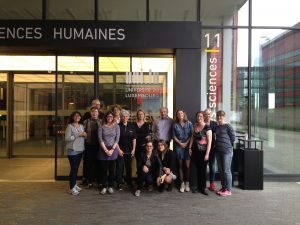 The second exchange was hosted by Universite du Luxembourg (UL) and Alzheimer Europe (AE). Participants attended for 1-2 weeks during the period from 13 June to 2 July. This exchange formed a solid basis for the data collection stages to follow. Led by Prof Dr Vjera Holthoff-Detto, participants created an interview schedule and guidelines for the interviews that will take place with both people with dementia and their caregivers in the following exchanges. Due to the differences ethics procedures in the participating countries (UK, DE, NL, ES), there will be some procedural variation in each context, but a common basis was agreed. The design participants began work on cards to be used when interviewing people with dementia (to provide visual prompts around activities of daily living), and diaries that can be used between interviews by the people with dementia as an engaging activity that will provide us with more detail about their experience. 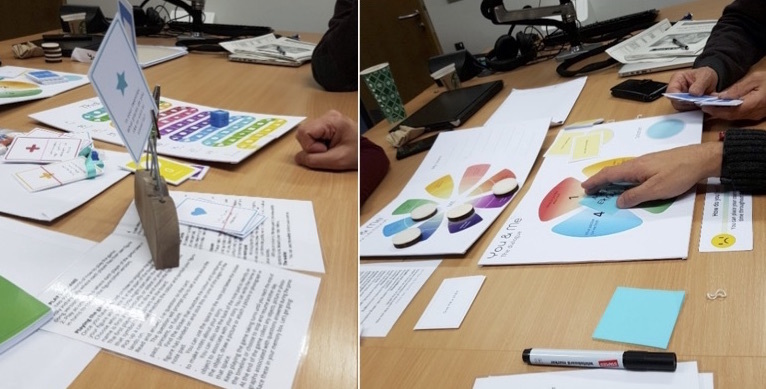 During the first exchange of the MinD project, that was hosted by the University of Wolverhampton (UoW) and Nottinghamshire Healthcare NHS Foundation Trust (NHT) we started our work on a mindful design approach to dementia care. This being the first exchange, to develop a mutual understanding between the different disciplines in the project, knowledge exchange formed a crucial part of this exchange. While our medical partners informed us about different types of dementia, mindfulness and research in the medical field, the design and technology partners updated the group on the current state of the art in design for dementia and assistive technology and the design research partners contributed by highlighting design research methods and findings from other design for dementia projects. Sticky notes session to generate and categorise first ideas. Through several discussions, a common ground was developed on what it means to design for dementia following a mindful approach. 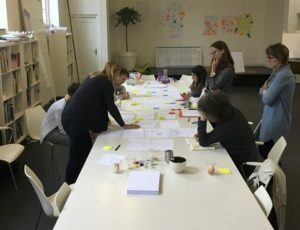 This common ground served as a basis to develop our first ideas on mindful design for dementia which in its turn helped us define what knowledge we need to generate from our user research activities. Following, a start was made on defining methodologies for data collection, these will be further developed during the next exchange in Luxembourg. In most of our discussions, public representatives from MindTech contributed. This ensured that the research group could reflect on their ideas and approaches. To further connect with care practice, the group made visits to care and demonstration facilities in and around Nottingham and Wolverhampton; Highbury Hospital, St. Francis Unit, Lings Bar Hospital, Wren Hall Nursing Home, Attenborough Nature Reserve and Bilbrook house. These visits have all highly contributed to the groups understanding of best practices and challenges in dementia care. As a team, we feel that our activities together have created a solid base to built our future work on and we are confident that the team in the next visit can use our work to further refine the data collection methods.